Essen hosts the worlds largest collector car fair and has traditionally partnered with Coys to offer an automobile auction. 2019 sees RM Sothebys join Coys in offering an auction although unlike Retromobile this is a relatively American style sale with over 200 lots on offer over the two sale days. While the majority of lots come from the Youngtimers Collection, a brace of Mercedes-Benz and a brace of hypercars lead the way. The first of these Mercedes is the 1937 540K Cabriolet A estimated at €2 – 2.4 mil. ($2.24 – 2.688 mil. ), a British delivered example, it was one of just 32 with the sporty Cabriolet A coachwork. This fine Cab A would later reside in France and Germany and most recently has been very well maintained, it also remains fully matching #s, making it a highly desirable example indeed. A 1959 300SL Roadster is the second Mercedes-Benz marquee lot with an estimate of €850k – 1 mil. ($952k – 1.12 mil. ), originally delivered to France this example has been “upgraded” with an alloy engine block. Just four owners from new and a substantial investment with Kienle and others, accurate pricing is hard to assess as this car merges both good quality and a replacement engine, although I come down on the side of this being a touch expensive. Two near unique hypercars also star, firstly the 2013 Bugatti Veyron Grand Sport Vitesse estimated at €1.5 – 1.7 mil. ($1.68 – 1.9 mil. ), this example was built for the Geneva Motor Show in ’13 it features a unique spec, just 550km from new and perfect condition. Veyrons are now reducing in price as the Chiron becomes more available and while this is much cheaper than two years ago, its still too expensive at the estimate. 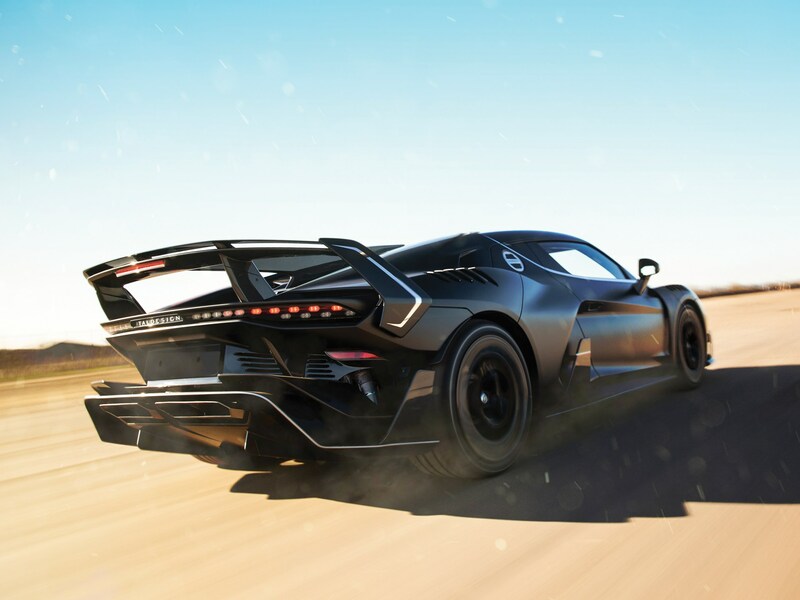 The second hypercar is the 2018 Italdesign Zerouno estimated at €950k – 1.5 mil, one of just five ever made, offered in ‘as-new’ condition, this is a car that would be difficult to acquire which makes its offering a chance for some lucky collector. Impossible to value accurately, it seems like market would be somewhere around the low estimate. 1930 Voisin C23 – Est. €300 – 400k ($336 – 448k), just 355 of the C23 were made in period and just 15 are believed to have survived. Restored a great cost and very much art deco, like many Voisins this is a highly artistic and futuristic car. Market correct. 1932 Mercedes-Benz 370S Manheim Sport Cabriolet – Est. €400 – 550k ($448 – 616k), a glamorous example of the small 370S. Restored in the 2000s with a new OEM engine, otherwise matching numbers. Market correct for the quality. 1937 Mercedes-Benz 320 Wendler Cabriolet – Est. €110 – 160k ($123 – 179k), difficult to assess as the description paints it as both pre and post war but my take is it is a pre war chassis that was rebodied post WW2. 1 of just 4 built, restored 30 years ago and now aging nicely, this would be a good, interesting car for a collector of coachbuilt classics. Probably market correct. 1949 Veritas BMW racer – Est. €450 – 550k ($504 – 616k), built on a genuine 1937 BMW 328 chassis, this was converted by Veritas to race spec at some point although that supposedly stalled due to their closure. Later fitted with a Bristol engine and transmission (based on BMW design of the same period), along with homemade coachwork it would take until the 1990s when it was restored for its English owner that it would be actually completed with Veritas RS coachwork. Restored by TT Workshops in ’98 this is a good but not perfect example of a very usable classic racer. Eligible for any and every race meeting anywhere, despite the concerns about its lack of originality, the price seems okay. 1954 Porsche 356 Pre A 1500 Cabriolet – Est. €250 – 280k ($280 – 314k), 1 of 270 built for ’55, fully restored to a high level. A little above market correct but likely okay. 1955 Mercedes-Benz 300SC Coupe – Est. €450 – 550k ($504 – 616k), retained by Daimler Benz as a test and factory vehicle, recently restored by Kienle to a high level. Market correct. 1962 Aston Martin DB4 Series IV – Est. €345 – 395k ($386 – 442k). A rare US delivery with ‘Normalair Air Conditioning’ from new, restored back in the 1990s, market correct if in better than good condition. 1967 Ghia 450SS Convertible – Est. €100 – 130k ($112 – 146k), an excellent car complete with rare original hardtop. Great buying. 1967 Maserati Ghibli 4.7 Coupe – Est. €180 – 250k ($202 – 280k). The 4th Ghibli made and displayed at the Geneva show in ’67, requires recommissioning but would be a unique talking point so value at the low estimate. 1970 Monteverdi 375/4 Saloon – Est. €200 – 240k ($224 – 269k), a super cool and very very rare original Monteverdi Saloon. Ideal if the 70s are your fave era. Very very difficult to assess but seems both expensive and market correct. 1971 Stutz Duplex Sedan by Padane – Est. 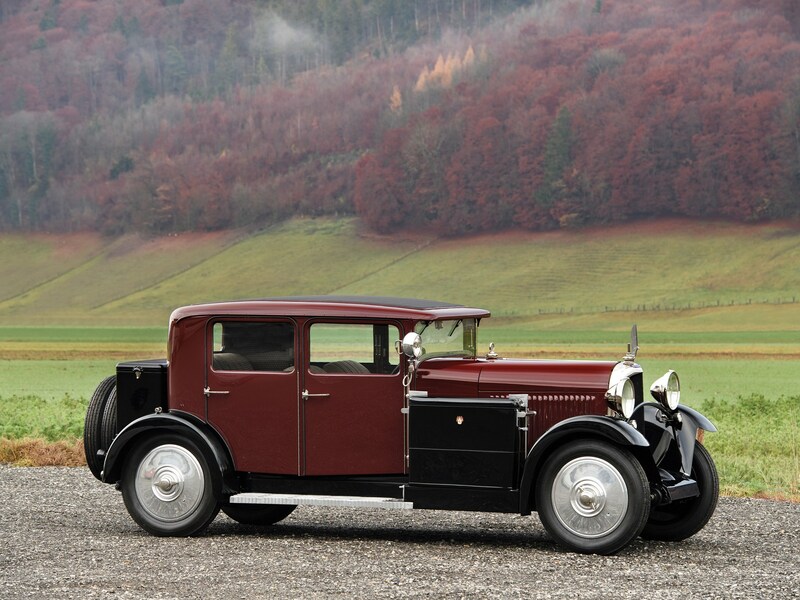 €135 – 150k ($151 – 168k), A rather crazy Stutz with Italian Sedan coachwork. Try and find another. Seems a little expensive. 1973 Porsche 911 Carrera RS 2.7 Touring – Est. €450 – 550k, ($504 – 616k), an Italian car, now in excellent condition. Recent sales have pegged them around the low estimate, so market correct. 1975 Lancia Stratos HF Stradale – Est. €480 – 520k ($538 – 582k), the 397th Stratos, originally Azzurro over Nero. Almost totally original and quite rare. Market correct. 1982 Lancia 037 Rally Stradale – Est. €350 – 400k ($392 – 448k), a road going 037 Rally that is in totally original condition. Might require some recommissioning before use. Market correct at the low estimate. 1985 Lancia Delta S4 Stradale – Est. €450 – 550k ($504 – 616k), a very original and rare car that has covered only 2.196 miles, market correct. 1986 Porsche RUF BTR Flachbau – Est. €225 – 275k ($252 – 308k), 1 of 3 built to this spec., pretty cool car and likely market correct. 1990 Mercedes-Benz 560SEC 6 litre Wide body Coupe – Est. €90 – 120k ($101 – 134k), a Japanese car, rare and quite collectible. Market correct. 1992 BMW Alpina B12 5.0 – Est. €100 – 120k ($112 – 134k), rare and unusual Alpina B12, one of 97 made. Likely market correct. 1992 Lancia Delta HF Integrale Evoluzione 1 Martini 5 – Est. €120 – 140k ($134 – 157k), a rare and highly usable Delta in great nick. Market correct. 1996 Lamborghini Diablo SE30 – Est. €395 – 495k ($442 – 554k), a cool, very rare car in great colours. Just 403km from new and so so collectible. Market correct. 2005 Mercedes-Benz CLK DTM Coupe – Est. €225 – 275k ($252 – 308k), Just 21,800km from new. Excellent example and very rare. Market correct, if not a little cheap. 2015 Land Rover Defender SVX – Est. €175 – 225k ($196 – 252k), 1 of 10 built for Spectre, 1 of 3 to survive. Very cool car. Market correct. 270 1954 Jaguar XK120SE Roadster – Est. €80 – 100k ($90 – 112k), a well maintained, SE example in good colours. Market correct. 2004 BMW CSL – Est. €80 – 100k ($90 – 112k), Japanese example of a rare BMW. Great car, likely market correct. 1964 Lancia Flaminia GTL 2.8 3C Touring – Est. €70 – 90k ($78 – 101k), restored many years ago and still said to be in beautiful condition. Market correct. 1964 Porsche 356C 1600 Coupe – Est. €60 – 90k ($67 – 101k), a desirable late model 356 in good spec. Restored many years ago, market correct. 1971 Citroen SM Coupe – Est. €60 – 80k ($67 – 90k), a SM that has had €85.000 spent restoring it. Beautiful car and possibly worth the strong estimate. 1976 Maserati Kyalami – Est. €60 – 90k ($67 – 101k), cool, rare Kyalami in good condition. A little expensive but probably worth it. 1979 Mercedes-Benz 500TE AMG – Est. €60 – 70k ($67 – 78k), A rare early AMG built 500TE, fast and usable if not sporty. Cosmetically restored in ’13 and well maintained since. 1994 Porsche 968 Club Sport – Est. €55 – 85k ($62 – 95k), desirable car in great colours, low miles. Exceptionally well maintained. Market correct. 1994 Mercedes-Benz E36 AMG Cabriolet – Est. €55 – 75k ($62 – 84k), 1 of 68 examples, great colour, very rare. A touch expensive but find another. 1988 Porsche 928 Koenig – Est. €50 – 60k ($56 – 67k), a custom Koenig widebody 928, restored in Kuwait, market correct. 1988 BMW 635CSi – Est. €40 – 50k ($45 – 56k), a Japanese/ swiss example in great nick, excellent future collectible. Market correct. 1964 Mercedes-Benz 230SL Pagoda – Est. €35 – 55k ($39 – 62k), truly original example with manual transmission, requires a restoration and its difficult to imagine that would be possible to achieve and not lose money. 1997 Mercedes-Benz 600SL – Est. €30 – 40k ($34 – 45k), Japanese 600SL, top spec. and loads of AMG options, classic colour scheme. Possibly market correct. 1997 BMW Alpina B12 5.7 – Est. €30 – 40k ($34 – 45k), A rare Alpina saloon with the 5.7 litre engine, still a very fast saloon 20 years on and as such cheap enough. 1991 BMW 850i – Est. €30 – 40k ($34 – 45k), Japanese car, good spec., great buying. 2000 BMW Alpina B12 6.0 Langversion – Est. €25 – 35k ($28 – 39k), Lovely long-wheelbase B12, Japanese car, wonderful condition. Likely market correct. 2001 Mini Cooper S – Est. €25 – 30k ($28 – 34k), 1 of the final 500 Mini Coopers, great car and very collectible, market correct. 1998 Mercedes-Benz CL600 AMG – Est. €20 – 25k ($22 – 28k), 1 of 24 with the 7 litre engine, market correct. 1996 Mercedes-Benz S600 – Est. €20 – 25k ($22 – 28k), Japanese car, great colours, very cool car. Market correct. 1987 Lancia Thema 8.32 – Est. €16 – 22k ($18 – 25k), super cool Ferrari powered Lancia, formerly part of the Baillon Collection, great future collectible. 1973 Fiat 130 Coupe – Est. €10 – 15k ($11 – 17k), a nice little Fiat with the 3.2 litre 6 cylinder engine and manual gearbox. Market correct. 112 1992 Jaguar XJS V12 Cabriolet SAJNW4843NC181461 €15,000 €20,000 N/R $16,800 $22,400 Finished in Signal Red with magnolia leather, beige hood and optional fog lamps, it’s just 11 V-12s made that year. According to the original service book which accompanies the car, this example is delivered to Jaguar of Thousand Oaks. Its first owner listed in the MDR Car Collection Inc., located at 9815 Wilshire Boulevard in Beverly Hills, on March 31, 1992. Interestingly, MDR has provided the movies for the industry. California, but at some point, it made its way to Japan and remained there until 2013 when it was exported to Europe. The car was purchased in 2015 by its current owner and imported to Switzerland, where it has remained ever since. 113 2001 Daimler Super V8 SAJKA25N61MF38917 €18,000 €25,000 N/R $20,160 $28,000 Among the last thing this long-wheelbase edition finished in special-order black with contrasting dove gray leather interior and beige lambswool carpets. Options included chrome mirrors and the leaper bonnet mascot. Delivered new to Japan, it remained there until 2016 when it was purchased by the previous owner and exported to Switzerland. Good enough to British royalty and politicians, these Daimlers served their owners well, and this example would have to be in luxury. 114 1996 Bentley Turbo R SCBZR15C2TCX57459 €20,000 €25,000 N/R $22,400 $28,000 This Bentley Turbo R was produced in Arctic White over a St James Red hide interior and delivered to Japan via official importer Cornes and Co as one of only 112 examples built for the 1996 model year, the Turbo R’s penultimate year of production. Exported from Japan in 2016, this Turbo R now resides in Switzerland after a spell in Norway. Beloved for their effortless performance and luxury, the Turbo R is an affordable way into Bentley ownership, and this example will not disappoint. 115 1979 Rolls-Royce Silver Shadow II SRK38930 €20,000 €25,000 N/R $22,400 $28,000 Silver Spirit launched in 1980. Ordered by Mariner’s Leasing Corporation, it is destined for Orange County, California, to become the leaser, Mr. M. Douglas. Mr. Douglas had followed Rolls-Royce’s advice for dual paint schemes, opting for Willow Gold over Olive with matching olive leather interior and dashboard top roll complemented by Wilton carpets in Honey Gold. A copy of the previous California title remains on file, with the article by Christine Lapidus of Los Angeles at least 1999 and remained with her until 2017 when purchased by the Consignor and exported to Switzerland. Boasting a fascinating color scheme in a wonderful condition, this is truly a Rolls-Royce for the Sophisticate. 116 1989 BMW 750iL WBAGC810003055241 €15,000 €20,000 N/R $16,800 $22,400 This pristine example on offer was delivered new to Japan and spent its early life there, before being exported to Europe. Passing through Belgium, it was then exported to the Netherlands and remained there until 2015. It was bought by the consignor, who imported it to Switzerland in 2017. Finished in the very elegant Burgundrot Metallic finish, this stunning E32 750iL is indeed an interesting choice even to this day. Offering a still contemporary executive-class experience, this 750iL is ready for its new life as a modern-day classic tourer. 117 1988 Mercedes-Benz 560SEC Cabriolet WDBCA45D2JA394026 €10,000 €15,000 N/R $11,200 $16,800 This stunning 560 SEC is presented elegantly in black with a matching black top over gray leather. Delivered to the United States in the year 2015 after passing through a large collection in the Cayman Islands and subsequently exported to Switzerland. Previous listings allude that the roof was removed and it was fitted with a power convertible. Opening up the luxury of Mercedes-Benz’s 560 SEC to the heavens, this is perhaps the ideal car for those looking to motor around in typical ’80s splendor. 118 1992 Mercedes-Benz 600SEL WDBGA57E2NA065829 €15,000 €20,000 N/R $16,800 $22,400 A U.S.-specification example, this example was delivered new through Carriage House of New London in New London, Connecticut, in May of 1992. Early service records show regular services until 1995 at just over 5,000 miles. It remained in the U.S. Northeast until the car moved to Colorado and was exported in 2016, showing 13,606 miles, and was purchased by its current owner shortly thereafter and shipped to Switzerland. Today it presents in well-preserved condition throughout, including bright silver metallic paint with stunning dark burgundy leather interior in excellent condition. Benefitting from V-12 power and luxurious appointments, this was Mercedes-Benz’s flagship model in 1992 and over 25 years later, it would still please the most discerning of motorists. 119 1976 Mercedes-Benz 450SLC 107.024.12.026694 €18,000 €25,000 N/R $20,160 $28,000 Documents on file show this 450 SLC was previously registered in Portugal for at least three decades before being purchased and exported to Switzerland in 2015. Presented in an attractive olive gold metallic over saddle leather with original bundt-pan wheels could easily be used either as an interesting daily driver or a fun weekend runabout. 120 1971 Stutz Duplex Sedan by Padane 364856 €135,000 €150,000 $151,200 $168,000 For those seeking an even more exclusive experience, Exner created the opulent Duplex sedan, stretching the original Blackhawk design and fitting it onto a Cadillac chassis to accommodate four doors and more interior room. Experts believe that they have just been built with Padane. George Norman Jr., of Salt Lake City, Utah. The ID tag displays its color as maroon, and given that information. A millionaire financier and investor, Norman what a Federal fugitive who disappeared on tax-related charges for some 23 years. Stutz Blackhawk Coupe and a ‘1971 four-door burgundy Stutz’; likely this car. It was sold to Florida and at some time painted white and fitted with wire wheels. Since then, The consignor notes that the finish is quite good with crisp lines and paintwork finished to a high standard. Door jambs are trimmed with stainless steel panels highlighted by Carrozzeria Padane insignias. The blue leather interior piped in gray remains very nice, showing evidence of light use and minimal wear. Underhood resides a Pontiac 400-cid V-8 massaged by Stutz and backed by a GM Turbo-Hydramatic transmission. Detailing is excellent and the consignor notes it to be a fine-driving car with outstanding cosmetics. This unusual coachbuilt Italian-American hybrid is sure to turn heads, with rarity and style worthy of the legendary Stutz name. 121 1953 Jaguar XK120 Roadster 674011 €160,000 €220,000 N/R $179,200 $246,400 Hoffmann in New York, on June 11, 1953. Originally specified with a Black exterior, Red leather interior and a Black hood , today, this stunning XK 120 Roadster is in perfect condition, in the same colors as when it left the Jaguar factory. Boasting its original engine and superb presentation, this XK 120 Roadster wants for nothing. The Jaguar XK 120 remains eligible for the World’s Greatest Historic Motoring Event, as well as the Mille Miglia Storica, Le Mans Classic and Tour car. 122 1956 Mercedes-Benz 220S Cabriolet 180.030.6505617 €125,000 €150,000 $140,000 $168,000 The most desirable version of the 220 S what the cabriolet model. Built to exacting cosmetic and mechanical standards, a cabriolet cost 75% more than a 220 S sedan, and it was easy to see why. The cabriolet could ride on the motorway in a fantastic style. Pontoon ‘cabriolet ever built, bearing body no. 6500001. Pictured in the factory brochure, one of the car’s unique features that makes it a hard cover that protects the convertible top when the top is down, rather than the leather cover seen on later models. Mr Bernhard Mohr, on 4 August 1956, the car would remain with Mr Mohr for nearly two decades until his death in 1971. After several years in the Mohr family, the car was purchased by Mr Hans Wacht, who started a restoration. By the early ’90s, with parts difficult to find, the car was not finished and Mr. Wacht sold the car to a restoration specialist in Beidweiler, Luxembourg. After two years of work, it was then again Mr. Josepheus Johannes Havermans, thus of Luxembourg. It then found its way to another owner before purchased by the consignor. Presenting beautifully in colors that mirror the car on the original 220 S brochure, this is a highly uncommon car. Adding to the fact that it is the very first ‘pontoon’ cabriolet, this is a highly significant automobile suitable for inclusion in any of the world’s finest collections. 123 2015 Land Rover Defender SVX SALLDHSP8FA462376 €175,000 €225,000 N/R $196,000 $252,000 An audience expects to be in terms of stunts,’ said Sam Mendes, director of Specter. The 24th Bond movie did not disappoint: 1,000 extras were hired for the opening scenes alone, and lots of time, resources and money were spent in the movie. A later chase sequence went down a mountain in the Austrian Alps, involving a plane and Land Rover Defenders, which was allegedly the most expensive stunt scene in film history. The stunt coordinator was tasked with creating a vehicle that could survive being struck by a plane, subsequently rolled, but that also looked aggressive and sinister. Jaguar Land Rover’s special operations team commissioned specialists Bowler to help. The firm was an obvious choice with a long history of developing Defenders for off-road motorsport and for defence clients, including the British Government. The firm transformed 10 regular Santorini Black crew-cab 110s into the SVX Concept, or Specter Defender. The cars featured a huge 37-in. tires, heavy-duty roll cages plus toughened suspensions with rose joints and bilstein rally dampers. A hydraulic handbrake was installed and repositioned. The engine was tuned to give 180 bhp and Recaro seats fitted. Three ‘halo’ cars with high finishes were created for close-up shots while the rest were destroyed. This particular vehicle is being fitted with a tank of hydraulic fluid. The ship is being piloted by James Bond. It did, leaving the chassis bent with just 16 miles on the odometer. Though fully functional, the car is unsuitable for being on the road but is preserved as the moment filming stopped. Movie cars like this film, but this example was spared. Defender production ends in January 2016, making this the last of this iconic model. This car is therefore a must for Land Rover devotees or Bond memorabilia collectors. 128 1963 Jaguar E-Type Series I 3.8 Roadster 879614 €190,000 €250,000 N/R $212,800 $280,000 JDHT Certificate, this E-Type was originally delivered to JD Boughman of Kokomo, Indiana, in 1963 via Jaguar Cars New York, and finished in Cream over a Black interior and a Black hood. E-Type presents wonderfully throughout, with its gray exterior and contrasting red leather interior. Still maintaining its original engine, and with a JDHT certificate confirming its original specification and delivery details, this is an excellent example of the Series 1 3.8-liter Roadster, considered by many to be one of the most widely used variants of the model. This E-Type wants to make a great choice for either shows or touring and is likely to leave a lasting impression wherever it goes, just as it did when new over 50 years ago. 129 1996 Porsche RUF Turbo R WP0ZZZ99ZTS372149 €200,000 €250,000 $224,000 $280,000 A huge amount spent on its conversion, which totals around € 130,000. The car received a bare metal re-spray into the hugely appropriate Signal Green. Rain gutters were removed, a RUF body added, as well as 19 “RUF rims, RUF seats, RUF steering wheel, RUF instruments, RUF doorsills, RUF pedals and Bilstein shock absorbers .This Turbo R is signed by Alois Ruf himself and a specially designed helmet in Signal Green, along with a range of receipts, paperwork and original books. Perhaps the ultimate version of the ultimate air-cooled 911, this car boasts not only the most potent supercars of its era, but also many on sale today. 130 1948 Talbot Lago T26 Record Cabriolet 101016 €150,000 €200,000 $168,000 $224,000 The early history of chassis no. 101016 is not known. Georges Brun, 10 Avenue de la République in Lyon, who may have been the first owner. It was purchased by Erich Traber of California in 1991 and brought to Switzerland. It was restored at the time when it was finished in Switzerland, and the restoration still presents superbly. Zenith carburettors on the T26 Grand Sport, giving a useful 20-bhp increase in power, as well as the extended chromed hinges on the trunk lid. By 2007 it was with Paul Meyer in Meggen, Switzerland, who spent upwards of CHF 55,000 on mechanical and other work. By 2011, Stefan Heidenreich offered the car for sale and it returned to Switzerland when it was purchased by its current Swiss collector Any Talbot-Lago is a driver’s car. With its powerful and responsive engine, the T26 Record is a captive and sporty experience behind the wheel. The proportions are beautiful from an angle and capture a pre-war charm was found in a post-war car. It is chic and ritzy, but at the same time a serious automobile for the driver who appreciates handling and power. Chassis no. 101016 is a real French grand routier, a rare opportunity to acquire great looks, sporty performance, genuine rarity and hand-built exclusivity in one elegant package. 131 1930 Voisin C23 47001 €300,000 €400,000 $336,000 $448,000 Although the C23 was manufactured in a modern style, it was successful by Voisin standards. In 1936, when the model went out of production, 355 chassis had been made, of which approximately 15 survive today. Voices were coachbuilt. Gabriel Voisin had a deep mistrust of coachbuilders, thinking that they were incapable of meeting his exacting engineering standards or achieving the demanding quality of his proprietary construction techniques. Indeed, C23 chassis 47001 is fitted with a Gabriel Voisin design. Given the chassis number, it is 47001 what the first or second C23 built. The car’s history prior to the early 1980s is not known. 47001 may have belonged to the famous privateer racing driver and member of the Thai Royal family. The car was released from the UK to Holland prior to 1985 and kept at the Air Force Museum in Soesterberg until 1992 when it was acquired by RT Meijer who enjoyed the car until his death in 2001. In 2005, ownership went to A. Th. Meijer of Wassenaar, an affluent suburb of The Hague. Meijer, who was commissioned to build a complete restoration, and from 2005 to 2008, approximately € 160,000 was spent on bodywork, mechanical restoration, chrome and nickel plating, as well as a complete refurbishment of the interior. As it may at all possible, including the retention of many of the internal parts of the engine, which has survived in a remarkably intact state. The body was repainted to a high standard by Martin Dijkhof. When the interior was re-trimmed, a piece of older material was discovered that was likely the original design. This was copied in France and used to complete the restoration. With a mere 15 survivors of the model, a Voisin C23 is a very rare automobile. Its style is a testament to the artistic Art Deco-inspired functionality of Gabriel Voisin designs. It is an automobiles where the rear-mounted double spares and large traveling trunks, are well-positioned to the rear of the running boards, testify to the car’s usability for serious long-distance travel, while the Grebel spotlight, polished wheel discs and mechanicals, as well as the gorgeous Art Deco interior, lend a high style that can only be French. In beautiful restored condition, this voisin wants to be a focal point in any collection, at any informal gathering of collectors and at any concours d’elegance. 132 1955 Mercedes-Benz 300SC Coupe 188.014.5500003 €450,000 €550,000 $504,000 $616,000 Mercedes-Benz 300 Sc chassis no. 188.014. 5500003 to 22 December 1955 to automobile factory Daimler-Benz AG at Mercedes street 136, Stuttgart Untertürkheim. Finished in special dark gray nitro-cellulose paint, at interior upholstered in light gray leather and a Becker Mexico radio mounted in the dash, the car was used by Daimler Benz as a test and factory vehicle to assess the newly developed injection system legendary Rudolf Uhlenhaut, who was heavily involved in the development of the injection system, so used the car. In September 1957, it was registered to the BP Petrol and Petroleum Company in Hamburg, where it has been used for testing fuel compounds. It is not known when the BP of the car. In 2007, a broker named Rolf Bunte contacted the famous German Mercedes-Benz specialist and restoration company Kienle Autotechnik on behalf of his client, to an older owner who was dissolving his collection. The car was still in its original nitro-cellulose paint with only 26,000 miles on the clock. It is likely that Kienle facilitated a sale to Hans-Joachim Sander in Berlin. From 2007 to 2009, the car was restored by Kienle Autotechnik on behalf of Sander, with great emphasis on originality and authenticity. The car was completely disassembled, the body professionally repaired in all areas and then repainted with nitro-cellulose paint in the original color. The engine and all other mechanicals, including the injection system, were restored to factory specifications. The interior was restored in perfect gray leather with black piping. Only original parts were used and, as far as they were no longer available, were replaced by parts that were reproduced according to original factory drawings. A 300 Sc epitomises all that is desirable in a Mercedes-Benz: prestige, presence and performance. It’s the modern successor to the great supercharged cars of the late 1930s, in particular the handsome 540K, whose style is echoed into the 300 Sc’s extended hood-line and fenders that flow gracefully over minimal running boards into a short rear end. In addition, this car boasts a fascinating period of history as a development car for Mercedes-Benz, plus later use by the BP petroleum company in Germany. Finally, the car has been given a world-class restoration by a leading specialist. 133 1932 Mercedes-Benz 370S Manheim Sport Cabriolet 84919 €400,000 €550,000 $448,000 $616,000 According to the Kommissionsnummer, or build sheet, 68066, 370 S chassis 84919 was shipped on 22 June 1932 by train via Weimar to the German town of Erfurt. In September 1933, the car was sold by the Daimler-Benz dealership in Nüremberg to a Herr Friedrich Wagner of Siernau-Scherneck near Coburg, Germany. Later, the car was owned by a furniture manufacturer named Stetter from Augsburg. The car survived the war and stood on blocks in the Stetter furniture factory until Mr Stetter’s heirs sold it in the 1950s to a dealer named Auto-Lehmann in Friedberg near Augsburg. By that time, the car had been fitted with a pointed Mercedes-Benz grille, possibly from a 320, and the original engine had been lost. Joachim Lehmann restored the car comprehensively, retrofitted an original flat radiator and gave it a red and white paint scheme complemented by an interior upholstered in red leather. After years of negotiations, this lovely 370 S Mannheim was acquired in the summer of 2004 by its current owner, who painstakingly restored it back to its original configuration as delivered in 1932. An expertise completed by the Mercedes-Benz Classic Centre in 2014 after the completion of the restoration concludes that while the engine is a replacement unit of the correct type, the car retains its original chassis, gearbox, and bodywork. The trim and tasteful lines of the 370S Sport Cabriolet are as appealing today as they were in the early 1930s. The model is rarely offered, and this is an exciting opportunity to acquire a very special and elegant pre-war Mercedes-Benz cabriolet that presents beautifully in every way. 134 1937 Mercedes-Benz 540K Cabriolet A 154078 €2,000,000 €2,400,000 $2,240,000 $2,688,000 The 540 K chassis no. 154078 was ordered on 4 August 1936 by British Mercedes-Benz in London on behalf of Page Motors Ltd. in Epsom, Surrey, a few miles southwest of London. On 7 December 1936, the finished car was delivered by Sindelfingen to be shipped by rail to London where it arrived on 12 December, resplendent in light green paint set off by a pale-yellow top, brown headliner and seats upholstered in the finest pig skin. Being an export to England, the chassis was right-hand drive and in the sporty Cabriolet A style with an integrated trunk and the spare wheel carried in an indentation in the elegantly sloping rear deck. Sindelfingen built 32 of these opulent cars, and only 18 are believed to exist today. The first owner was a Mr Paine who likely lived in Warwickshire, as the transport archive of the Kithead Trust shows that the car passed from an owner in Warwickshire to a second owner in London in December 1937 with license plate no. EPK 402. A photo of this car from the 1960s is pictured in Volume 2 of Jan Melin’s book Mercedes-Benz 8. In addition, the Kithead Trust states that the car was likely last licensed in the UK sometime around 1960 and that it was possibly exported in 1964, likely to France. The next owner was a Jean-Paul La Fuge who lived on Avenue Rapp in Paris. From 1992 to 2009, the car was in the ownership of Eduard Bollmeyer of Bünde, Germany, and in 2009, he sold it to Eric van Lammeren of Munich. Van Lammeren kept chassis no. 154078 until 2015, and from 2010 to 2014, he had important mechanical repair and fettling work carried out that totalled more than €50.000. In addition, approximately €40.000 were spent at the Mercedes-Benz Classic Center in 2015 and 2016, all of which can be inspected in the very comprehensive file that accompanies the car. In 2015, a Manufacturer’s Expert Assessment of chassis no. 154078 was commissioned from Mercedes-Benz Classic. The conclusion of this very thorough and complete investigation into the details of the car was that while the restoration displays a different livery compared to when it was new, it is correct and numbers matching. Not only are major mechanical components such as the engine block, gear box, rear axle and steering assembly the original pieces manufactured by Mercedes-Benz for chassis no. 154078 in the fall of 1936, the body is also the original body that was first mounted on the chassis and all numbers found on the car match the Kommission paper, or build sheet. Even the composition of the steel of the chassis members was analysed, leading to the conclusion that the steel is the correct metal used by Mercedes-Benz as chassis steel for supercharged cars in the 1930s. The Mercedes-Benz 540 K remains one of the best-known and iconic models of the immediate pre-war years and was a technological yardstick by which the power and performance of lesser cars were measured. A number of body styles were offered, designed and constructed by Sindelfingen. All shared the powerful 540 K chassis and high-quality body construction. But while most of the sold cars were practical and roomy closed cars or four-seat Cabriolet B or C styles, few were bodied to the highly desirable and sporting Cabriolet A configuration. With its close-coupled two-seat body, set-back radiator, sweeping fenders and integrated trunk, it cut a dashing figure indeed. The 540 K Cabriolet A is a scarce model in itself. The extraordinary level of originality and authenticity offered by chassis 154078 makes it a very rare automobile indeed. 135 1989 Porsche 911 Turbo WP0ZZZ93ZKS000836 €90,000 €110,000 $100,800 $123,200 This example, finished in the classic combination of Guards Red with black leather interior and Fuchs alloy wheels, which was delivered to its first owner in Germany in August 1989, making it under the last 930 Turbo built. During the 1990s it passed through two owners in Italy, and the next owner was a Dutch airline pilot based in the Netherlands. He purchased the car in 1999. In 2001, his brother bought the car and imported it to the UK. The current owner purchased the car 15 years ago to add to his private collection. In 2007, he returned to Porsche Classic in Stuttgart for a month-long renovation with no expense spared. Last year, he sent it to a Porsche specialist in the Netherlands for a further service. The owner has used it sparingly, covering barely 3,000 km during his ownership. Today, the car retains its full original tool kit, air pump and manuals along with a documented service history with invoices. Marque collectors are now focusing attention on the late G50-equipped 930s, and this cherished example is an ideal addition to any collection. 137 1990 Mercedes-Benz 560SEC 6 litre Wide body Coupe WDB1260451A588227 €90,000 €120,000 $100,800 $134,400 AMG gauges, and body panels to cover the track against the suspension. Original delivery location is listed as Baden-Baden, but the car finally shipped to Japan. AMG 6.0 AMG 6.0 WideBody should be enthusiastically gifted with high-horsepower German machines. 138 1997 Mercedes-Benz 600SL WDB1290761F155401 €30,000 €40,000 N/R $33,600 $44,800 Produced in May of 1997 and originally delivered to Japan, this particular SL 600 remained there until it was exported to Germany in 2016 and purchased by the consignor the following year. It is all the more special for its exceptional condition and full suite of AMG extras. These include 18-in. split rim alloy wheels, exterior body kit, carbon-fiber interior trim, signature instrument dials, exhaust system, steering wheel and power pack for the M120 V-12. It retains its classic Mercedes factory specification of Brilliant Silver with a black hood, over two-tone black and gray (extended) leather interior. Its matching hardtop accompanies the sale. The R129 is almost becoming a modern classic, and the larger displacement versions are well sought after. This AMG grease V12 SL 600 is well worth consideration. 139 1996 Mercedes-Benz S600 AMG WDB1400571A303211 €30,000 €40,000 N/R $33,600 $44,800 This car left the factory in December of the same year. AMG upgrades, including a power pack for the M120 V12, instrument cluster and trims as well as the AMG monoblock alloys with machine-polished edges. It is also a long-wheelbase example and features multi-contour rear seats with footrests. It remained in Japan until 2015 before being exported to Germany, where it was purchased by the consignor later that year. There are few other cars that offer the comfort, performance and exclusivity of a long-wheelbase W140 S600, even among contemporary sedans. This is a pristine example and remains a very fine way to travel long distances in absolute comfort. 140 1975 Mercedes-Benz 450SEL 6.9 116.036.12.004068 €50,000 €70,000 N/R $56,000 $78,400 Presented in an understated silver over black color combination, this example if right in the middle of 450 SEL 6.9 production. This is a satisfying touring car bound to elicit admiring glances from knowledgeable enthusiasts and a car that will surely keep other contemporary automobiles at bay. 141 1986 BMW Alpina B7 Turbo WAPB7TL016B710196 €75,000 €100,000 $84,000 $112,000 Presented here is no. 196 of the 278 examples produced. Alpina wooden gear-knob, bespoke instrument cluster, sports steering wheel and bucket seats. On the exterior it retains its Alpina body kit, coach lines and iconic finned wheels. In the same year, the owner of the car was purchased in 2017 and exported from Japan to Switzerland. An incredibly potent and equally rare sedan, the B7 Turbo / 1 what truly makes a world-beating sports saloon and the perfect car for the individual looking for a practical four-door sedan, but with sports car performance. Guaranteed to provide thrills for its next owner, this B7 Turbo / 1 would be the perfect youngtimer for the enthusiast. 142 1997 BMW Alpina B12 5.7 WAPBC57L06RD30066 €30,000 €40,000 N/R $33,600 $44,800 While this particular example is not known, it has been purchased by its current Owner from Owner in Poland in mid-2016. Finished in dark blue with gold Alpina pinstripes over a black leather interior, the Alpina details continue within the marque’s typical blue and green seat inserts and stitching. This rare B12 5.7 is ready to storm the highway and leave lesser four-door sedans in its wake. 143 1984 BMW Alpina B9 3.5 WBADA710109276251 €50,000 €60,000 $56,000 $67,200 Of the 500 B9 3.5s built in Burgundy red with black cloth interior. It retains this color scheme, along with its Alpina decals, body kit, steering wheel, instrument cluster and multi-spoke wheels. It recently exhibited at the Chateau de Coppet Concours d’Elegance Suisse and presents commensurately. This is a very tidy example of a wonderful driver’s saloon. 144 1999 BMW M5 WBSDE91000GJ16966 €40,000 €50,000 N/R $44,800 $56,000 Finished in Imola Red II over full Black Nappa leather, this example was delivered new to Japan and resided there until 2016, when it was purchased and imported to Switzerland by the consignor. Considered by many to be the quintessential M5, to the casual passerby, an E39 M5 is no more outlandish than a regular 5 Series sedan of the same generation, and is the perfect gentleman’s hot rod, just as practical as it is exciting to drive. This example presents very well and will surely please its next owner. 145 1992 Porsche 911 Carrera RS WP0ZZZ96ZNS490584 €160,000 €190,000 $179,200 $212,800 This copy, built in silver with black leather, was newly delivered to its first owner in Varese, Italy. Then it went through several hands in both Germany and Luxembourg, before it finally acquired the current owner in France. Today, this car is in predominantly original condition with just under 49,200 km on the clock. 2014, the car was completely repainted. Carrera RS models are among the best of the 964er generation and are 911er for genuine Porsche fans. Built for the perfect driving experience and dispensing with any distraction or extra weight, the Carrera RS allows its owner to experience the great pleasure of driving – on the road or on the racetrack. 147 1964 Lancia Flaminia GTL 2.8 3C Touring 826.140.1248 €70,000 €90,000 $78,400 $100,800 First owner of Flaminia GTL chassis 1248 was a Hubert Bruwier, who bought the car in Italy and shipping to his native Belgium. Later he went to Mathieu Helling and in 1978 to the current owner in 1978, which underwent a complete technical and cosmetic restoration. Today the car presents itself in beautiful condition in the elegant coloring of dark blue metallic with red leather. There are also the original log books, workshop manuals and extensive documentation. A very practical Gran Turismo, built for long distances in comfort and style. 148 1968 Shelby GT500KR 8T02R215905-04135 €150,000 €175,000 N/R $168,000 $196,000 This stunning GT500 KR was delivered to Stark Hickey Ford of Royal Oak, Missouri, in the stunning Lime Gold paint in which it is presented today. An accompanying Marti report confirms that additional options include power disc brakes, shoulder harnesses, a sport deck rear seats, AM radio, power steering and power disc brakes. GT500 KR, including extensive service records. These include a detailed breakdown of the work being completed during 2009/2010 and totaling € 8,600 in 2018. Presented in excellent condition, this GT500 KR wants for nothing and is ready to be enjoyed, its new owner truly enjoying the full ‘King of the Road’ experience. 149 1962 Aston Martin DB4 Series IV DB4/850/L €345,000 €395,000 $386,400 $442,400 Chassis no. DB4 / 850 / L was originally delivered to California Sage over Fawn to Mr Thomas McGraw, MD of New York. The Aston Martin factory builds the records with the ‘Normalair Air Conditioning’ from new, which is exceptionally rare on a DB4. At some point this original air conditioning system has been replaced with a more modern arrangement. It is believed that the car remains in North America in its original specification for some 30 years before returning to Europe with an Austrian collector. Following its return to Europe service work by Aston Martin in 1995, and the car restores to its current color combination of dark gray over fawn leather. The car is currently fitted with triple SU carburettors as per Special Series specification and a five-speed gearbox for improved refinement at high speeds. 150 1954 Porsche 356 Pre A 1500 Cabriolet 60641 €250,000 €280,000 $280,000 $313,600 According to documentation from Porsche France, this example, chassis no. 60641, was delivered on 8 August 1954. One of just 270 built for the 1955 model year, it has been fully restored to a very high standard. It is thus reported that the highly desirable radio, often missing or inoperable, functions properly. Of great interest is that the car retains an original, highly rare bench seat, most of which has been replaced by separate bucket seats. With its highly desirable bench seat and beautiful overall presentation, this car is an ideal example for extended driving tours, shows or for high-speed runs along twisty roads. 151 1982 Sbarro 540K Spezial Roadster Replica 003 €240,000 €290,000 $268,800 $324,800 While cosmetically similar, the Sbarro 540 K uses modern materials alongside the mechanical components of late-model Mercedes-Benz offerings. The 240-hp V-8 engine and automatic transmission come from a Mercedes 500 SE, and the chassis incorporates elements from a 300 SEL 6.3 and a Class S, including four-wheel disc brakes. As it would be expected, the lightweight plastic body, with a top speed of 220 km / h, some 40 km / h better than the original. Jacky Setton, Mr Bacou who used the car as a daily driver, and finally the consignor, who has owned the car for the last five years , The consignor reports that the car runs beautifully and has always been maintained, a fact that is supported by a file of maintenance invoices totaling some € 20,000. It has recently received new carpet and a new convertible top. Simply put, this is a highly functional, incredibly beautiful machine that marries classic design sensibilities with contemporary driving comfort. Though originally planned for a production run of 12, just eight Sbarro 540 K were built from 1981 to 1985. They are just due to their low production number and the nearly unmatched driving experience they offer. The car is superb, the production quality amazing and the performance exhilarating. The 540 K has certainly contributed to the reputation of Franco Sbarro in the ’80s and will surely turn heads wherever it goes. 152 1935 Auburn Eight Supercharged Cabriolet 33326F €140,000 €180,000 $156,800 $201,600 Auburn coupés, but the example offered here is a genuine and authentic cabriolet. Auburn Cord Duesenberg Club members, among them the late Jim Miller, of Baden, Ontario, as well as the Blackhawk Collection, are well-known and knowledgeable. The gentleman who was the car to the consignor, an ACD club member for many years, owned the car for nearly a decade, and he had it refinished in its striking black and red color scheme approximately six years ago. The polished disc wheels are correct, rare and valuable, and the red leather interior is in the correct pattern. Most importantly, the correct dual ratio rear axle, a standard feature of the supercharged cars, still functions properly. Can-Am Meet tour in the Detroit area prior to its purchase in 2014 by the consignor home in France. It would be open up to become one of the best American cars of its era. 153 1936 Cord Phaeton FB781 €130,000 €180,000 $145,600 $201,600 Though its earliest history is not known, the car offered here in 2007 in Alabama by the previous owner. In his care, the car received a two-year comprehensive restoration at a facility in Spain, during which no expense was spared. Best in Class and the public prize at the prestigious 2010 Madrid Concours. Since its award-winning performance, the car has been well maintained and always cared for. Presently residing in France, Cord 810 Phaeton’s are available in Europe, and this would make a great companion at any number of automotive events. 154 1937 Packard One Twenty Rollston Allweather 113035 €65,000 €95,000 $72,800 $106,400 While his early history is not known, this Rollston-bodied Packard was first acquired 30 years ago by the father of the current owner, a well-known Dutch collector. All-Weather Cabriolet coachwork by Rollston, with the other known example being vehicle number 1042. Overall, the car presents very well, with a leather interior that has recently been retrimed. It would be a charming addition to any collection of American Classics. 158 1959 Mercedes-Benz 300SL Roadster 198.042.9500093 €850,000 €1,000,000 $952,000 $1,120,000 Ivory over black leather interior. The 300 SL offered here. The car has a new hardtop which retains to this day. In more recent times the car’s original steel engine block has been upgraded to an alloy version. According to information supplied to the vendor, the car’s first owner was a Madame Feraud in the South of France. In 1978, Michel Ferry, then a Member of the Board of Directors of the Automobile Club of Monaco. Bernard Consten, five times Tour de France Automobile winner and six times 24 Hours of Le Mans participant, including 1962 class victory. Finally, 2013 the car’s fourth owner sold his much loved 300 SL back to its German homeland. Upon the car’s return to Germany the last private owner made a substantial investment in it. Invoices from Kienle Automotive Engineering and Walter Pusch These invoices include a full brake system, suspension, gearbox and differential overhaul, including various other mechanical and cosmetic improvements. The car has been retrieved by Kienle and this work is detailed in a photo file accompanying the car. In total, 170 hours of labor were invested in the mechanical work alone, and over € 80,000 was spent to bring the car up to its current high standard. Finally, the all-important fuel injection is completely rebuilt. The car has only covered a few thousand kilometers since this work was completed. An engineering and design masterpiece that offers a truly sublime driving experience, over 60 years after it was first introduced, the 300 SL remains the gold standard of sports cars of its era. This example checks all the right boxes and would be happy to use as its manufacturers intended. 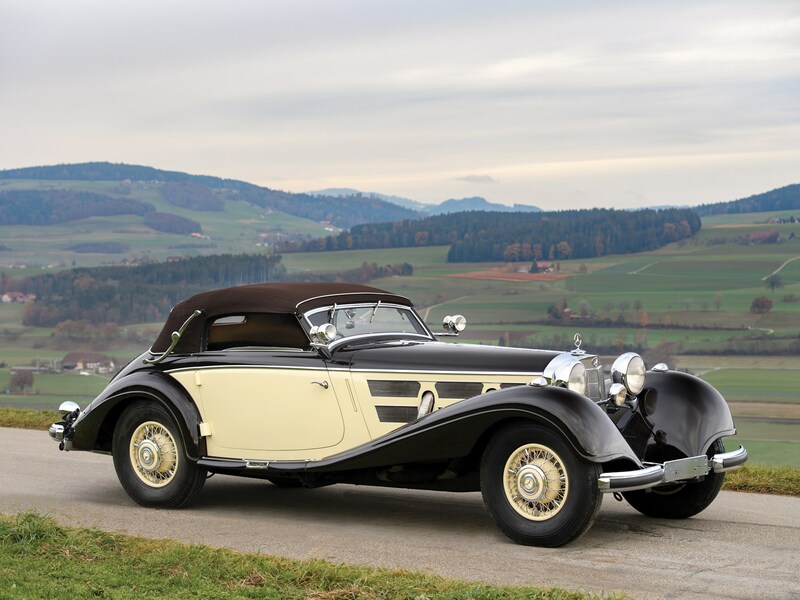 159 1937 Mercedes-Benz 320 Wendler Cabriolet 172932 €110,000 €160,000 $123,200 $179,200 The car offered here is a truly fascinating look at the world of post-war European coachbuilding. It was built by Wendler, one of the great European coachbuilding companies since the 1840s. Though they were perhaps best-known for producing the legendary Porsche 550 Spyder, Wendler was thus known for producing some of the finest one-off custom cars of the period. It is believed that Wendler built four ‘pontoon’ convertibles in the early 1950s, each with an original design. Mercedes 320 chassis, stands out because of the unique headlamp in the middle of the grille and the door for the spare tire in the front fender. The car in June 1950 and a photo of the Wendler was at the Reutlinger Motor Show in 1950. Furthermore, it is fitted with a desirable Maibach four speed gearbox. According to documentation supplied by the Consignor, it is believed there were just two owners between 1950 and now. The car received a full restoration between 1983 and 1988 in Augsburg, Germany. The quality of the work is evident today, as it still presents beautifully. The last owner got the car in his possession in 1994 and it drives it, as it was just as December 2018. It remains ready to return to the road on any number of rounds, and it would make an excellent candidate for any number of concours events. This coachbuilt Mercedes-Benz truly personifies the exuberant nature of the age while remaining grounded in the pre-war era. It wants to make a fine centerpiece for any Mercedes Benz or coachbuilt automobile collection. 162 1967 Ghia 450SS Convertible BS4032 €100,000 €130,000 $112,000 $145,600 This Ghia 450 SS is elegantly finished in light charcoal metallic. Kept in excellent condition throughout, the paint finish is smooth, glossy and all the bright work that accents the tasteful Ghia coachwork sparkles. Ghia gauges tastefully arrayed before the driver. Power steering, power brakes, heater and windshield washers add to the effortless driving experience and overall enjoyment of the car. This Ghia comes with a very rare and desirable factory removable hardtop. The current owner has enjoyed this seldom-seen exotic automobile for nearly three decades, as well as exercising it regularly. A rare survivor of a very low-production, coach-built sports car, this handsome and sophisticated Ghia 450 SS represents an excellent opportunity for the discriminating collector and enthusiast. 163 1976 Morgan Plus 8SS Lightweight R8112 €50,000 €75,000 N/R $56,000 $84,000 Two cars were agreed to be built but unfortunately, the ACO changed its rules again, rendering the Plus Eight ineligible for Le Mans. However, as of the winter of 1975–1976, the cars were already under production. Garlick and Team Normog decided to forget about the project, but John MacDonald of I. & J. MacDonald, the Morgan dealer of Lanchester, Durham, in the UK stepped in to see the project to fruition, and only one car would be built. According to Morgan factory records, chassis no. R8112 was completed by the factory on 24 June 1976. Further records show that it may have returned to the factory for further development, leaving again on 2 July 1976. Further factory records show that it was fitted with a non-standard ‘Traco’ Oldsmobile 215-cu. in. V-8 engine and a special gearbox (said to be from a Triumph TR8 prepared for rally use). Its aluminium bodywork and wings were finished in black paint with the interior trimmed red leather with a red tonneau cover and black convertible top and side screens. The car was also fitted with 15-in. wire wheels with centre-lock hubs shod in Avon tyres, front disc and aluminium rear brake drums and dual circuit non-servo brakes, a roll cage and aluminium floor boards, making for a bespoke, race-ready build. Allegedly, at its time this was the widest Plus Eight ever built and the only one with wire wheels. First registered in the UK with registration no. OTN 4 on 1 July 1976, John MacDonald used the car himself for about 2,000 miles on the road but unfortunately the engine failed and the block was destroyed, necessitating a replacement. Another Oldsmobile block was sourced but with conventional solid lifters. Later sold to David Johnston after a few competitive outings, Johnston continued to race the car after MacDonald converted the gearbox to a close-ratio five-speed. Passing through Paul Edwards and Charles Windridge in 1986, the suspension was rebuilt to include negative camber, Panhard rod, adjustable Gas-Spax dampers and anti-brake tramp struts, and Windridge competed with the car in the MSCC Morgan Challenge in 1987 before selling it to John Worrall, a well-known Morgan dealer. Worrall sold it to the consignor in Sweden that same year. Following an engine rebuild during the winter of 1987–1988, which included fitting a new camshaft, the Morgan’s locking rear differential was replaced with a limited-slip differential and ventilated discs with four piston callipers and the front and new disc brakes at the rear, replacing the original rear drums. Raced in several events in Sweden, it was predominantly used as a road car there before being placed into storage. It would be a wonderful car for either vintage racing events or simply to drive and enjoy on the open road. Boasting a unique story and specification, it is difficult to imagine a more exciting Morgan for the racing enthusiast. 165 2000 Rolls-Royce Silver Seraph Park Ward SCALA61E4YCX05151 €30,000 €35,000 N/R $33,600 $39,200 The Rolls-Royce Silver Seraph is an incredibly luxurious car, both visually arresting and imposing. Presented in Masons Black with magnolia Connolly hide and black piping, however, this example stands out from the rest. Having covered a minimal 6,300 miles, the interior and exterior present incredibly well. The Wilton wool carpets are trimmed in black, complementing the rest of this stunning car, while the walnut trim throughout the interior is in fine condition and the mobile phone in the armrest still has its original plastic covering. Delivered new to Kanti Gandhi of Glenview, Illinois, in November of 2000 finished in Black over Cotswold leather, options extras included a sunroof, chrome wheels and embroidered headrests. This stunning Silver Seraph spent the majority of its life in Illinois before moving to Massachusetts and was exported to Switzerland when it was purchased by its current owner in early 2017. Among Silver Seraphs, this car stands out, and, as such, would be a benchmark example for Rolls-Royce enthusiasts. 166 1997 Rolls-Royce Silver Spur SCAZN20C5VCX60257 €30,000 €40,000 N/R $33,600 $44,800 This car was delivered new to Japan by official the Rolls-Royce importer, Cornes and Co. It would remain in Japan until October 2016, when it was exported to Switzerland after being acquired by the current owner. Exuding quintessential British sophistication and class, this would be a wonderful example to enjoy from either behind the wheel or whilst being chauffeured in the rear. 167 2001 Mini Cooper S SAXXNPAZEYD184882 €20,000 €25,000 N/R $22,400 $28,000 Born as an RHD-specification example with a manual transmission and the 1275 MPi engine with a 10.1:1 compression ratio, this car was one of the very last Classic Mini Coopers built before production transitioned to the new-style Mini Cooper. It is accompanied by a certificate signed by John Cooper stating that it is the 11th built of the final 50 production cars. Finished in Black with Silver stripes over a black and silver leather interior, the car is presented in virtually as-new condition throughout, having travelled less than 850 miles from new. Furthermore, it is important to note that the car was converted from its original right-hand-drive specification to left-hand drive for ease of use in the consignor’s home market. In his collection, it has remained beautifully preserved and maintained, with its last in-house full service taking place in January of this year. An icon of British motoring and presented with less than 850 miles from new, this would be a fun addition to any collection. 168 1992 Range Rover SALHV1249NA614906 €20,000 €25,000 N/R $22,400 $28,000 Having only covered less 24,000 miles from new, this 1992 is presented in stunning condition throughout. Delivered new to the U.S., the accompanying CARFAX report shows that it spent the vast majority of its early life in Utah before moving east to Georgia where it was purchased by the current owner in 2017 and exported to Switzerland. With its go-anywhere status and finished in the gorgeous Portofino Red body paint, this 1992 Range Rover is an icon ready be enjoyed at any time for years to come. This low-mileage example is certainly amongst the finest. 169 1991 Bentley Turbo RL SCBZP03A8MCX36294 €25,000 €30,000 N/R $28,000 $33,600 This pristine, extremely low-mileage and rare LWB example was delivered new in March 1991 in Japan, as evidenced by the Cornes & Co., Ltd plaques on its door sills and presents in stunning condition throughout. Exported in 2015 from Japan to Europe, it was acquired by the consignor in Germany in 2016. With over 300 bhp on tap, these cars are as fast as they are luxurious, and they are perfectly suited for long-distance driving. This example surely will not disappoint. 170 1998 Rolls-Royce Silver Spur Limousine SCAZY20C5WCX80534 €25,000 €30,000 N/R $28,000 $33,600 This example is one of 10 Silver Spur Limousines destined for Japan and one of 38 of its kind in total. Like this car, just 17 were produced in left-hand drive. It spent the vast majority of its life in Japan and was only imported to Switzerland by its current owner in 2016. This stately limousine offers the last word in luxury for a fraction of its original price. 171 1975 Datsun 280Z HLS30-211804 €15,000 €18,000 N/R $16,800 $20,160 Finished in White over a black leather interior, this 280 Z was built for the 1975 model year. American-specification bumpers and indicators. Although its history is not known, it has been exported from United Arab Emirates in 2017 to Switzerland with its current owner. Now nearly 45 years old, this would be an ideal acquisition for the enthusiast looking for their first collector car. 172 1982 Nissan 280ZX Turbo JN1CZ04S1CX628484 €15,000 €18,000 N/R $16,800 $20,160 This 280 ZX Turbo spent much of its early life in Texas, before moving to new ownership in North Carolina, prior to its departure from the U.S. in 2015. Two years later, it was purchased by the consignor and exported to Switzerland. Even today, this 280 ZX Turbo can stand toe-to-toe with its contemporary rivals. 173 1992 Nissan 300ZX Twin Turbo JN1CZ24H6NX521112 €20,000 €25,000 N/R $22,400 $28,000 Delivered new to Avis Nissan of Fayetteville, Arkansas, this 300ZX Twin Turbo has just traveled over 25,000 miles in wonderfully original condition. The car remained in Arkansas until 2015 when it was imported to the United Arab Emirates, according to the CARFAX, and was exported to Switzerland in 2017 by the current owner. Finding another example in such original condition is not an easy task. As a result, this 300ZX Twin Turbo should not be overlooked. 174 1986 Mitsubishi Starion ESI-R JA3BC54N6GZ027047 €10,000 €15,000 N/R $11,200 $16,800 Santa Barbara, California, antiques dealer. Nissan-Datsun dealership in November of 1986. The top-of-the-line Starion, ordered in silver over black leather, features a body with boxy, flared fenders and is powered by a turbo-charged inline-four, all part of the recipe of a 1980s road rocket. Deep-reaching front air dam and low-drag pop-up headlights add to the theme. Why the owner, almost 60 years old at the time, parked the car after less than 10,000 miles is a mystery, but the Starion was certainly loved by Mr Yeabsley. After his unfortunate passing in 2016, where it would have been wanted Mr. Yeabsley would have wanted. 9,300 miles from new. The Starion ESI-R represents a rare opportunity to experience a well-loved, well-maintained car absolutely loaded with mid-1980s technology. 213 1991 Jaguar XJ-S V12 Coupe SAJJNJEW4EP182530 €15,000 €20,000 N/R $16,800 $22,400 This example was among the first cars finished in metallic regency. Its early history is not known, but it has been exported from Japan to the UK in 2015 and has been acquired by its current owner one year later and exported to Switzerland. Presented today in wonderful condition throughout, it would be a wonderful twelve-cylinder Jaguar to drive and enjoy. 214 1990 Jaguar XJ12 SAJJDALW4CM481554 €15,000 €20,000 N/R $16,800 $22,400 “This example, finished in dark blue with Isis blue leather interior, is from Japan to Switzerland. Those looking for stately English luxury should look no further. 215 1996 Rolls-Royce Silver Spur SCAZN11C2TCX57371 €20,000 €25,000 N/R $22,400 $28,000 Delivered new through Rolls-Royce of Beverly Hills in October of 1995, this Silver Spur was originally finished Black over Sandstone leather, just as it appears today. It spent the first few years of its life in California before moving to Illinois in 2000, allegedly still with its original owner, showing 11,200 miles on its odometer. The car remained there until 2015 when it was purchased by the current owner and imported to Switzerland, showing 21,413 miles from new. Importantly, invoices from Bentley Geneva are on file for service totalling to €16.568.00. The car has been driven less than 200 miles since then and presents very well. Finding a better example surely would not be easy. 216 1995 Range Rover SALHE124XSA660871 €18,000 €25,000 N/R $20,160 $28,000 According to the accompanying CARFAX report, this California sample has spent almost all of its life in Southern California. The car was exported to Europe in 2013, purchased by the current owner in 2016 and subsequently imported to the Netherlands. 41,450 miles, as evidenced by the accompanying CARFAX, stating the odometer 141,458 miles from the new at the time of export , Range Rovers of the 1990s have always been a passionate following, and well-presented examples are always in demand. This example would be ideal for the individual looking to drive and enjoy one of England’s most iconic automobiles of its decade. 217 1987 BMW Alpina B7 Turbo coupe WAPB7TC017B730113 €140,000 €160,000 $156,800 $179,200 While only 130 B7 turbos were built on BMW’s E24 6 Series chassis and drivetrain, there was a model that was much rarer still. 17 catalyst-equipped B7 Turbo Coupés, designed the B7 Turbo Coupe / 3 instead of B7 Turbo Coupe / 1. These cars produce only 320 bhp, compared to the 330 bhp of their non-cat siblings. However, they produce more torque at a lower RPM, 520nm at 2,400rpm as opposed to 512nm at 3,000rpm. Furthermore, the engine boasts slightly lower compression, a ratio of 7.45: 1 instead of 8.0: 1. While normally slightly less power would make a model less desirable, in Alpina circles due to their rarity and lower-end grunt, making for more tractable performance. Previously registered to an individual in Bern, this example is beautifully outfitted in black paint over a red leather interior. Inside, a plaque reading ‘Car Interior Wenger, Interior Exclusive’, Alpina, The interior of the car in front of it, voluptuous red leather and fitted with sports seats. Riding on Alpina Multispoke Wheels is a complete trunk-mounted tool kit and first aid kit. Furthermore, it has been upgraded with a Sony CDX-J10 CD player with a trunk-mounted disc changer. A seldom-seen Alpina for the connoisseur, this B7 Turbo Coupe / 3 would surely attract lots of attention wherever it goes. 218 1992 BMW Alpina B12 5.0 WAPBC50C02D110054 €100,000 €120,000 $112,000 $134,400 Delivered in January of 1992 according to a copy of its original invoice, this B12 5.0 retains its original specification of Alpina Sapphire Blue with gold Alpina pinstrip over a Black leather interior. Only 97 B12 5.0 coupes were built, and this one example would be a fine addition to any collection. 220 1985 Renault 5 Turbo 2 VF1822000F0000679 €80,000 €90,000 $89,600 $100,800 Seeking to lower production costs but not suffer from a loss of performance, in 1983 Renault pared down the Turbo into what would become the Turbo II. These road-legal cars proved incredibly popular. Copies of previous registrations on file show that this example was first registered in Wolfsburg, Germany, in 1986 before moving to the Netherlands, and finally Belgium, and was purchased by the current owner and exported to Switzerland in 2016. It is a perfect introduction to rallying’s 1980 heyday. 221 2000 Rolls-Royce Silver Seraph Park Ward SCALD61E5YCX07515 €50,000 €60,000 $56,000 $67,200 This Silver Seraph was delivered to Japan in 2017 when it was purchased by the consignor. Its odometer shows less than 3,750 km from new, which is believed to be both in and out. This luxurious Silver Seraph deserves to hit the open road again, while cossetting its occupants in traditional English opulence. 222 1987 Mercedes-Benz 560SEC WDB1260451A342053 €25,000 €30,000 N/R $28,000 $33,600 Delivered new to its native Germany through Mercedes-Benz’ Mannheim branch, this example is finished in a very distinguished black with protective grey lower panels and a black leather interior and presents well throughout. Its timeless style by Bruno Sacco will look just as good in 10 years’ time as it did when it was new. 223 1966 Porsche 911 303511 €140,000 €190,000 $156,800 $212,800 This early 911 was built in 1965 for the 1966 model year. The current owner acquired the car in 1991, treating it to a sympathetic restoration in 1994. Restoration work performed a high-quality paint refining and mechanical refurbishing. The engine was rebuilt and balanced by a marine specialist, and the car fitted with new exhaust, heat exchanger and Koni shock absorbers. The Solex 40 PL carburettor and original Bendix fuel pumps were rebuilt. Inside, this Porsche Blaupunkt Cologne radio with Hirschmann antenna, reflecting the low-mileage and superb originality of this Porsche possesses. Featured in several automotive magazines (Flat 6, Retro Course in France, and RS in Italy), and Best of Show in 2013 at Monza, this Porsche 911 has received many accolades form the automotive press and enthusiasts alike, all in agreement that this is an exceptional car in many ways. 224 2011 Porsche 911/997 GT3 RS WP0ZZZ99ZBS780295 €150,000 €175,000 N/R $168,000 $196,000 Delivered in 2011 to the United Arab Emirates, this 997.2 GT3 RS boasts a number of desirable options. These include Porsche Carbon Ceramic Brakes (PCCB), a red-painted roll cage and seat belt, lightweight carbon fiber-backed bucket seats trimmed in Alcantara, interior carbon fiber pack, PCM with navigation and the sport-chrono package, among other options. Specified in gray with red accents and black interior, it has a presence to match its performance. The car presently shows just under 9,300 km from New York and remains in excellent condition throughout. The GT7 RS with a manual transmission, the 997.2 GT3 RS has already become a modern-day collectable and will surely have a place in the heart of enthusiasts for years to come, thanks to its infectious performance and wonderful handling. Already one of the great 911s, which is desirable as a track or a weekend toy, this example is sure to be its next owner whatever its intended use. 225 1967 Maserati Quattroporte AM1071342 €45,000 €85,000 N/R $50,400 $95,200 Originally finished in Argento Auteuil over a Blu interior, this Series I Quattroporte was delivered new with a five-speed manual gearbox to its first owner, Sergio Leoncini of Verona, on 20 April 1967. The car passed to Carlo Zanetti of Treviso in 1973. Two years later, the Quattroporte was put into storage and remained parked for 25 years. Removed from storage and purchased by its current owner in Germany in 2000, it was shipped there and restored from 2001–2004. According to the owner, the interior was found to be in such good condition that only the driver’s seat had to be reupholstered. The car was featured in Motor Klassik in November 2013 as the cover story. Furthermore, the car received a service in January 2019 and is ready to return to the road. Presented in a very desirable colour scheme and retaining its original engine as confirmed by Maserati Classiche, this would be an ideal foray into the collector car hobby for a young enthusiast. 226 1976 Maserati Kyalami AM129006 €60,000 €90,000 N/R $67,200 $100,800 An exceptionally early production example, Kyalami chassis no. 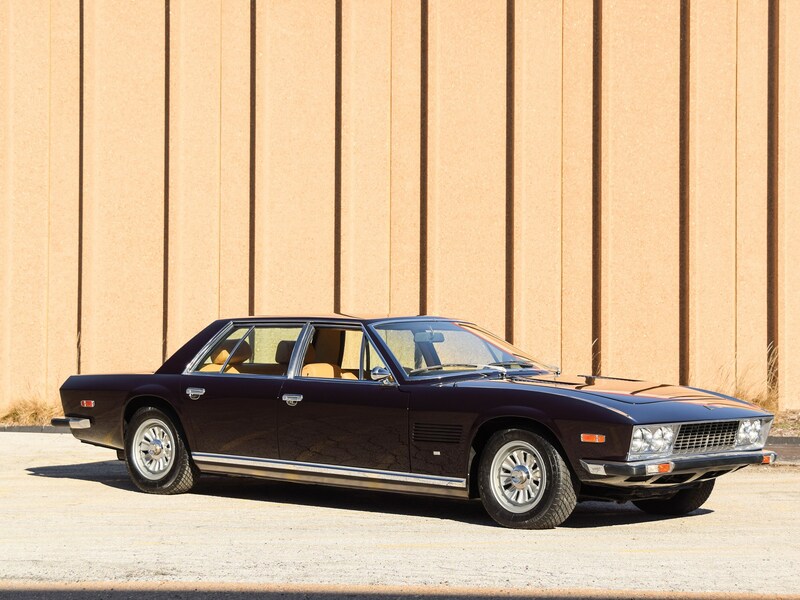 006 was originally finished in Celeste Chiaro over Senape leather, and completed by the factory on 30 November 1976, Information provided by Maserati Classiche confirms that the car remained in the Modena area after delivery and was actually retained by the factory for testing purposes and later owned by Alejandro de Tomaso himself. Originally finished in Celeste Chiaro over Senape Connolly leather, there is an additional factory notation that the car was fitted with a Borg Warner automatic gearbox in July 1988. After leaving its native Italy, the car was sold to the Netherlands in 1993 and would remain there through 2007. In 2011, it was purchased by the current owner and has been well preserved in his collection amongst other Maseratis. Recent service work includes €25.000 spent on a mechanical overhaul and some bodywork in 2015 by Fa. Schiemenz in Bonn followed by another €20.000 spent on overhauling the transmission on 2016. Arguably one of the most compelling cars of the De Tomaso era, the Kyalami is a fascinating part of Maserati’s history, and this example is even more interesting than the rest. 227 1984 Ferrari 400i 49825 €75,000 €100,000 N/R $84,000 $112,000 Chassis no. 49825 what born as a fuel-injected 400 finished in understated Marrone metallic paintwork over a Crema interior with the desirable five-speed manual transmission. It was sold in Switzerland and first registered by him in early 1984. It remained in Switzerland until 2014 and was purchased by the current owner that year. Regularly driven and always serviced by Ferrari-authorized mechanics, which was carried out in 2014. The 58,551 kilometers are on the odometer. Furthermore, the car has been given Ferrari Classiche certification, confirming that it retains its original engine and gearbox, and is finished in its original colors. Boasting Ferrari Classiche certification, this would be a wonderful car for the enthusiast looking for a four-seat, twelve-cylinder Ferrari to drive and enjoy. 228 1974 Maserati Indy 4.9 AM116/492132 €75,000 €125,000 N/R $84,000 $140,000 Completed by Maserati on 13 February 1974, this Indy 4.9 was finished in Marrone Colorado over a White leather interior and delivered to Hans Schlatter in Lugano, Switzerland, through Bjarsch, Maserati’s importer in Switzerland. Amazingly, the Indy remained with its original owner for 30 years and was purchased by the consignor in 2004 and imported to Germany. The owner states that he is still wearing his original interior. Although the Indy remains hugely original throughout, it has not been driven in several years and will likely require mechanical testing prior to returning to the open road. An exceptional late-production ZF gearbox, this car’s highly original condition and two-owner history makes it a true stand out. 229 1982 Ferrari 512BBi 39723 €200,000 €280,000 $224,000 $313,600 Delivered new to Perugia, Italy, in 1982, this lovely 512 bbi remains there for roughly the first nine years of its life and is said to be serviced in Perugia at 30,000 km in October of 1991. Later in the 1990s, it passed to a P. Mimran in Dully, Switzerland, on the shores of Lac Léman. Patrick Mimran, the former CEO of Lamborghini, until 1997. Passing to an individual in Berne in 1998, one year later the vehicle was imported to Germany since. Chassis no. 39723 passed through two German owners prior to its purchase by the third and current German owner, who purchased the vehicle in 2005. The consignor notes that it has been used for 14 years, accumulating some 4,000 km since his purchase. Only serviced by authorized Ferrari dealers during this time, the 512 BBi’s last service was in 2015 at Ferrari Eberlein. Argento paintwork and modern backer Grand Prix radio with cassette player. Furthermore, the car has been given Ferrari Classiche certification, confirming it retains its original engine and gearbox, and is finished in its original color combination By the time production came to an end in 1984 when the 512 BBi was replaced with the Testarossa, Ferrari had just built 1,007 fuel-injected BBs. Sergio Scaglietti, and today it remains a well sought-after model for many enthusiasts, boasting aggressive looks with equally impressive performance. Finding an example in a desirable color combination and for the enthusiast. 230 1967 Maserati Ghibli 4.7 Coupe AM115004 €180,000 €250,000 $201,600 $280,000 Amongst the earliest Ghiblis produced, this particular example of a chassis no. 004 and what produced by Maserati in March of 1967. Finished in Rosso Rubino with a white leather interior and fitted with a manual transmission, it was built on time Maserati’s stood at the 1967 Geneva Motor Show. While the Ghibli Was Introduced at the 1966 Turin Motor Show, this undoubtedly would have been the first Ghibli seen in the flesh or photographs by many enthusiasts, and certainly helped to grow the model’s overall desirability and appeal, especially when finished in eye-catching Rosso Rubino. Another interesting point to note is the design of a slightly different trunk lid design, which is indicative of early production Ghibli coupes. Following the show at the Geneva Motor Show, chassis no. 004 remained in Switzerland and was sold to an owner in Chiasso. Unfortunately, at some point in his early life, he died in February of 1975. In a letter to Max Saxer of Hinwil, in February of 1975. It was repainted green and retrimmed with a black interior , Amazingly, the Ghibli would remain with the Saxon family for the following 38 years, passing from Mr. Saxer to his son, hence named Max. The consignor purchased the car from the Saxon family in October of 2013 and had it delivered to Germany, where it resides on display as the keystone of an interesting collection of Maseratis. Since then, the car has not been driven and would probably need to be recommended. 1967 Geneva Motor Show colors would certainly offer a number of opportunities to show the car at concours events worldwide. Ferrari’s 365 GTB / 4 Daytona Berlinetta. Maserati of its era, the Ghibli proved to be an excellent grand touring car and could easily hold its own against Ferrari’s 365 GTB / 4 Daytona Berlinetta. Of the 1.149 examples produced, this is perhaps one of the most desirable, benefiting from Geneva Motor Show history and ownership in the same family for nearly 40 years. It would be an exciting addition to any collection of Maseratis worldwide. 231 1956 Jaguar XK140SE DHC S812547 €180,000 €245,000 N/R $201,600 $274,400 This XK140 SE OTS was, according to its accompanying JDHT Certificate, manufactured on 7 June 1956 and sold through Jaguar Cars of New York. Originally specified in Pearl Gray, with a Red interior and a Black soft top, this car today is in a very tasteful gray over tan hide, classically understated, yet very elegant. XK140 SE has traveled less than 450 miles. Truly a car for the discerning Jaguar collector, this is a special equipment that is, indeed, very special. 232 1958 Mercedes-Benz 220S Cabriolet 180.030.7506788 €100,000 €140,000 $112,000 $156,800 This example is a truly rare car, not least because of the times when it was built. London – where it was registered in 1958 to Dr Ian Mackenzie Munro – what slowly emerging from wartime. Foreign cars, especially German marques, have been found to be serious and expensive to import. As a result, just 20 are believed to have been made to survive today. Its wonderful period registration documents reveal the car in July 1970, and it remains in Scotland with the same family for the next 43 years. They drove the car back to Mercedes Benz, Stuttgart, in 1974 for a new clutch, service and tuning. In June 2009, a sympathetic restoration was taken. In 2014, RM Sotheby’s sold the car to the present owner who has used it for tours and refurbished the mechanical parts, such as suspension and brakes. In 2017, the present owner decides to repaint the car, stripping it down to bare metal at Speedy Garage near Lausanne in order to do so. Today, the original leather seats and carpets are retained and the immaculate dashboard features a rare His Master’s Voice Radio Mobile radio and speaker. It retains all the original handbooks and wallets. Cherished and rare, it’s a 1950s Mercedes Tourer. 237 1994 Porsche 911/993 Turbo WP0ZZZ99ZRS310004 €295,000 €395,000 $330,400 $442,400 Presented here is a very interesting factory that has been in private hands for many years. Its chassis number identifies this car as the third R-Program Type 993 chassis constructed by Porsche in early 1994, when the new model replaced the 964. Accompanying documents indicate this particular case WELCOME TO PORSCHE’S RACING AND TECHNICAL DEVELOPMENT UNIT AT WEISSACH. After the conclusion of its factory testing, the car was sold through a Porsche dealership in Hofheim to the consignor. Both the engine and the gearbox have been removed from the car before it has been released. When the 993-generation 911 Turbo was officially introduced, Porsche delivered the engine and gear box to the consignor, reiting it with its original chassis and body. This 993 Turbo is believed to be the only one to survive. Finished in black (Black) with a gorgeous red leather interior and complementary red carpeting, with “Twist” alloy wheels, a rear window wiper, air conditioning, electric windows, 12-way adjustable seats, rear-seat delete with additional storage and a Blaupunkt Symphony entertainment system. As a piece of Porsche history, prototypes escape the factory’s hands and are often destroyed by Porsche once model development is complete. As such, this is not an opportunity to be missed. 238 1987 Porsche 911 Turbo Cabriolet WP0ZZZ93ZH5020102 €170,000 €200,000 N/R $190,400 $224,000 This 911 Turbo Convertible was acquired by the Consignor in Germany almost 10 years ago, showing just 48,000 km at the time. Under his ownership, this car has traveled just 2,500 km and has been regularly maintained by his favorite Porsche mechanic in Greece, despite its minimal use. Sharing a stable with other notable Porsches, this stunning Turbo Cabriolet can hold its own in any collection. 911 Turbo Cabriolet is on the button, ready to be driven and enjoyed by its new owner. 239 2009 Ferrari 430 Scuderia 159175 €140,000 €160,000 N/R $156,800 $179,200 This particular F430 Scuderia has been delivered to Modena Sport Sarl of Toulouse in March 2008. It presents itself beautifully in its eye-catching Giallo Modena color scheme, with a racing stripe in Grigio’s Corsa and yellow callipers. Inside the nero seats are contrasted by yellow stitching and a yellow tachometer, while the trims are carbon fiber throughout. Naturally, Charles Pozzi of Paris in January 2019 has always been expertly cared for by Ferrari’s main dealership. 240 1965 Maserati Mistral 3.7 Coupe AM109528 €175,000 €200,000 $196,000 $224,000 Grigio Newmarket over Nero leather. 1 of 383 built with 3.7 litre engine and manual gearbox. Italian car when new. Fine example. via RM Paris ’16 $239k & via RM Monaco ’18 not sold $175 – 225k. Cancelled Italian libretto. 241 1993 Porsche 911/964 Turbo 3.6 WP0ZZZ96ZPS470280 €190,000 €250,000 N/R $212,800 $280,000 This stunning 1993 964 Turbo 3.6 was specified with a black exterior over a black leather interior and polished wheels. Delivered as standard, with the 3.6-liter engine, later, it was sent to Porsche Strasbourg for fitting the desirable X88 pack. Throughout its life, this Turbo 3.6 has been maintained, as evidenced by a comprehensive range of service stamps and a large number of invoices, which accompany the car. Presented now in excellent condition, with less than 80,000 kilometers on the odometer, this hugely desirable X88-equipped 911 Turbo 3.6 would make a significant addition to any Porsche collection. 242 1991 Bentley Turbo R SCBZR03AXMCX34914 €20,000 €25,000 N/R $22,400 $28,000 According to its original service manual, this Turbo R was produced for the 1991 model year and finished in Royal Blue over St James Red leather. While the car’s early history is not known, it was exported from Japan in 2016 to Europe and purchased by its current owner roughly one year ago. Additionally, it is important to note that the car still retains its original engine and is presented in exceptional condition throughout. For the individual looking for a Turbo R in a unique colour to drive and enjoy, look no further. 243 1990 Bentley Turbo RL SCBZP03A4LCX31317 €20,000 €30,000 N/R $22,400 $33,600 This car has spent its life in Japan until being exported to Switzerland in 2016 when purchased by the current owner. Ordered in Dark Oyster over a Red leather interior with matching red Wilton carpets. Among the options were walnut picnic tables for the rear passengers. Beautifully presented today, it comes complete with original owner’s handbook, service book, and warranty card, which confirm that the car is still presented in its original colour scheme and retains its original engine. For the enthusiast looking to jump into Bentley ownership, this would be a wonderful choice. 244 1999 BMW 750i L7 WBAGK61010DG10301 €25,000 €30,000 N/R $28,000 $33,600 This particular 1999 example was sold to its first owner in Japan, where it resided until it was exported to the Netherlands in 2016 prior to being bought by the current owner, who imported it to Switzerland the same year. Finished in BMW Individual’s shade of Orientblau metallic and presented in immaculate condition throughout, this L7 is one of the most perfect choices for the classic car enthusiast looking for a contemporary executive-class style motoring experience. 245 2000 BMW Alpina B12 6.0 Langversion WAPBC60L01LD32017 €25,000 €35,000 N/R $28,000 $39,200 This long-wheelbase B12 is now offered for sale, which was originally delivered to its first owner in Japan in December 2000, and which has been exported to Belgium in 2016. Specified in Titanium Silver with black leather and walnut trim, it is the only example to be finished in that color scheme and presents in wonderful condition throughout. 246 2007 Daimler Super 8 SAJCA82R28TH24971 €15,000 €20,000 N/R $16,800 $22,400 This example was ordered in Red Effect with contrasting leather interior and caramel piping. Thus, the following were specified: chrome portfolio side vents, 20 “alloy wheels, lamb’s wool carpets, boxwood inlays, electric rear sunblind, electric front and rear seats, touch-screen center control unit, four-zone climate control, satellite nav and TV screens the headrests. Delivered new to Belgium in November 2007, according to documents that accompany the sale, the car remains there until at least 2011, when it moved to Germany. It was purchased by the current owner and imported to Switzerland in 2016. Today, 39.846 km from the catalog. With a pedigree, look no further. 247 1993 Jaguar XJ-S V12 SAJJNKES4EP188497 €15,000 €20,000 N/R $16,800 $22,400 This 1993 XJS V-12 was first delivered to Japan, and was subsequently exported to Switzerland in 2016 after being purchased by the current owner. Finished in green over a beige leather interior, arguably the most desirable colour combination for the model, it presents very well and would be an ideal car for extended touring. 248 1997 Mercedes-Benz CL600 WDB1400761A374393 €25,000 €30,000 N/R $28,000 $33,600 Violin metallic, a deep purple, over a two-tone gray leather interior with wood trim. Delivered to Japan. Purchased from Japan in 2015 by the current owner and subsequently exported to Switzerland, invoices on a service completed in March of 2016. The car presents beautifully and would be perfect for the individual looking to fly under the radar with a touch of class , 249 1991 Mercedes-Benz 560SEC WDB1260451A577664 €25,000 €30,000 N/R $28,000 $33,600 Originally exported to Japan where it remained until 2014 before being exported to Europe, this example is finished in an unusual and very attractive Pearl Grey Metallic, which appears as a subtle blue-grey, over a blue leather interior, the colours it was born with. While most 560 SECs were the usual tones of grey or black, this example wears its colours well and is a tasteful way to stand out from the crowd. 250 1966 Aston Martin DB6 DB6/2590/R €300,000 €340,000 $336,000 $380,800 Built in January of 1966, this Aston Martin DB6 chassis no. DB6 / 2590 / R was originally finished in Fiesta Red with a black leather interior, with a heated rear windscreen and a Motorola radio. It would remain in its native England in its early days and what first delivered to Crabtree & Nicol of Sheffield and what later bought by Henry Wigfall & Son Ltd. Bye bye Mr. Law, Stephen Ross in the 1980s who exported the car to Calgary, Canada. In 1985, this DB6 underwent a left-hand-drive conversion with support and assistance from the factory. At the same time, it has been fitted with power steering (a rare, yet attractive option first offered with the DB6). The DB6 underwent an extensive renovation beginning in 2005 by Canadian specialists Auto-Mann. RS Williams of England, with additional components sourced from the highly respected specialists Steel Wings of Ivyland, Pennsylvania. During the restoration, the original engine block, head and carburetor pots were retained, and it was fitted with new pistons, rods and valves. Furthermore, the complete braking system was rebuilt with factory pots. Wilton wool carpeting was laid out as a new headliner. Extreme care was taken to use factory building techniques to create the original look and feel as possible, both inside and out. After work was completed in 2006, Brian Ford of California would become the DB6’s next owner, and it was sold the following year. The following owner installed new springs, shocks and tires and replaced the anti-roll bar for improved handling, a common upgrade known as the Harvey Bailey handling package. This program includes further attention to the brakes and the suspension overall. Returning to Europe, the car in a collection of over 50 automobiles. In late 2015 the car was sent to Aston’s Riviera Cars of Paris, where it was freshly serviced. The car has been exceptionally well preserved since then and is presented in beautiful condition. Perfectly bridging the gap between performance and luxury, the DB6 is a wonderful car for someone looking for Aston Martin’s quintessential 1960s style with added practicality. It would make a great long-distance tourer. via RM Amelia ’09 sold $121k & RM Paris ’16 sold $429k 251 1972 Lancia Fulvia 818.360.035406 €20,000 €30,000 N/R $22,400 $33,600 Formerly owned by Prince Rainier III of Monaco, 1.3-litre, 90-bhp four-cylinder engine with five-speed gearbox, A lovely driver’s Fulvia with royal history 252 1971 Lancia Fulvia 1.3S Rally 818.630.007163 €30,000 €40,000 N/R $33,600 $44,800 Participated and finished the Rally Monte-Carlo Historique in 2017 and 2019, Fully rebuilt for vintage rally use in 2016, Ready for continued use in vintage racing events 253 1970 Lancia Fulvia Coupe Rallye 1.6HF Fanalone 818.540.001810 €60,000 €70,000 $67,200 $78,400 Delivered new to Italy with just four owners from new, Presented in highly original and unrestored condition, Accompanied by its original Italian Libretto, One of about 1,258 such examples manufactured in 1969–1970, Ready to race, drive and enjoy 254 1992 Lancia Delta HF Integrale Evoluzione 1 Martini 5 ZLA831AB000567800 €120,000 €140,000 $134,400 $156,800 The ‘Martini 5’ serial no. 111 was built in February 1992 and purchased by Alvaro Nanni, who registered it in Ravenna on 11 September 1992. After 20 years of ownership, it passed to Giannantonio Bussinello of Verona and one other owner before being purchased by the current seller. It is in remarkably original condition, particularly its distinctive interior. In 2015 the car received a full service, including cam belt replacement and turbo reconditioning. Even a quarter century after its production, the legendary Delta HF Integrale Evoluzione continues to set the standard for performance and road-handling. This is an amazing opportunity to acquire an Evo 1, in a rare ‘Martini 5’ Special Edition. 255 1975 Lancia Stratos HF Stradale 829ARO001832 €480,000 €520,000 $537,600 $582,400 Lancia’s production records coordinate chassis no. 829AR0 001832 with Bertone body no. 397 and confirm the original colours of Azzurro with “Sereno” carpets, black Alcantara seating surfaces, black seat shells and dashboard and black flocked door panels. Body no. 397 left Bertone’s Grugliasco Works on 21 October 1974, and Lancia completed assembly about 12 weeks later, on 9 January 1975. Chassis no. 829AR0 001832 was sold to Guido Bignardi of Palermo, first registered PA 421048 on 21 February 1975. Remarkably, Bignardi kept the car for 30 years before selling it to Carlo Pungetti of Bologna on 20 March 2005. Pungetti retained the car for 10 years, when it was purchased by the current owner. It has never been restored, remains original throughout and appears as-delivered without the optional roof spoiler and roof-mounted air deflector. The paint appears largely untouched, and the interior remains totally original, remarkably including undamaged seats, whose lightweight Alcantara facing is almost invariably seen frayed, if not replaced. The car comes with its original Italian libretto and owner’s manual. A preserved survivor, this Stratos HF Stradale presents the opportunity to own one of the most original remaining examples of this rally legend. 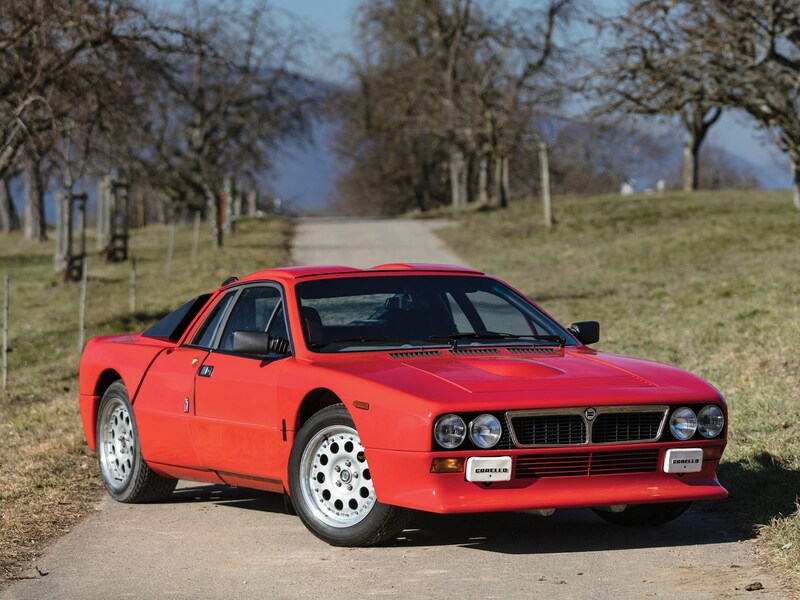 256 1982 Lancia 037 Rally Stradale ZLA151AR000000022 €350,000 €400,000 $392,000 $448,000 0022 was first registered PA 733158 on 24 May 1984 to Francesco Pio Bignardi from Palermo. The Bignardi family is well known in Italian rally circles, but 022 remains a road-going example and was not used in competition. Carlo Pungetti of Bologna purchased the car in 2005, but never registered it. Instead it remained warehoused with the rest of his collection. In 2015, it was sold to the current owner in Germany. Today, chassis no. 0022 remains in an unrestored condition and presents a rare opportunity to acquire an important group B homologation special. 257 1985 Lancia Delta S4 Stradale ZLA038AR000000155 €450,000 €550,000 $504,000 $616,000 A true time capsule, this 1985 Delta S4 Stradale has covered only 2.196 miles in its 30-plus year history. According to the owner, the car has been delivered to Italy before returning to its owner in Germany before returning to Italy with the current owner. In his ownership, the car was fully serviced in July of 2018. It is accompanied by its original books, documents and tool kit. Finished in the classic combination of a lovely tan Alcantara interior is a brilliant example of Lancia’s rally icon. 258 1950 Cadillac Series 62 Convertible 50628361 €50,000 €60,000 N/R $56,000 $67,200 This particular Series 62 convertible was brought to Europe in 1999 after being acquired by an Italian enthusiast. The consignor notes that the interior and top are still original, and that it has been repainted in its original shade of glacier green and dark green leather interior. During its time in Italy, it has been well maintained and preserved. Importantly, both the power top and power windows are said to work perfectly. Seldom seen in continental Europe, 1950s Cadillacs are representative of post-war American growth. These cars were a symbol of success for those lucky enough to own and drive them, and Cadillac ownership was made famous in automotive culture as the embodiment of the American dream. For cruising route 66 or just driving down to the local diner, in 1950 there was no better option. 259 1959 Alfa Romeo 2000 Spider Touring AR102.04.00384 €70,000 €100,000 $78,400 $112,000 Although this is the second edition of Spider’s Life in America, Max Hoffman’s Famous New York dealership was released in March of 1959 in Louisiana, as a sticker on the windshield prior to restoration suggests. According to documents in the car’s history file, which was purchased by David Kaufman of London in 1989, it was probably taken for a nut-and-bolt restoration which never took place. Still dismantled, the car was purchased by the current owner in 1996 as a restoration project Andrew Thorogood in London and Paolo Bergia in Pinerolo, Turin, where painstaking attention to originality was paid. Amazingly, during the restoration no rust was found, and no major metalwork was needed. Further work has been carried out between 2006 and 2011 to ensure a perfect condition throughout. The car was refinished in the quintessential color of Rosso Alfa, and the seats were trimmed in leather instead of the original leatherette. Alfa Romeo is a wonderful opportunity to acquire one of the most desirable spiders from the years of ‘La Dolce Vita’. 260 1976 Porsche 911 Turbo 930 670 0564 €150,000 €200,000 N/R $168,000 $224,000 Here is a selectable example of Porsche’s awesome 911 Turbo from the 1976 model year, finished in the ever-popular Guards. Along with the standard and very extensive turbo equipment package, it was ordered with an optional black headliner and a heavy-duty starter engine. Sold by the Glöckler dealership in Stuttgart on May 6, 1976 and with a known history, it has been driven barely 7,000 km since a full restoration in Germany and presents beautiful throughout. Thrilling to drive in every respect, the 911 Turbo What the performance benchmark of its day and remains. Every Porsche enthusiast should experience the thrill of Porsche’s rawest form of street-legal turbocharging. 261 1936 Rolls-Royce Phantom III Inskip Sedanca da Ville Replica 3BT161 €135,000 €235,000 $151,200 $263,200 Rolls-Royce Foundation records indicate that chassis no. 3BT 161 was sold to JS Inskip, Inc. on Jan. 12, 1937 to John Paine of Troy, New York. The chassis arrived in the US on the SS Scythia on 24 May 1937. Fitted with five-passenger, enclosed drive saloon Inskip coachwork, the RRF’s Schoellkopf Cards provide the provenance of the car, showing a series of US owners in Pennsylvania and Delaware as late as of June 1976, at which time the car was said to be in a very poor shape. Seduca de Ville coaching in the style of Inskip was fitted in 1992-1993. The consignor bought it from Tony Paalman in the late 1990s and attesting to the quality of the work, it has been shown at the Villa d’Este Concorso d’Eleganza in 1997 and Paleis het Loo in the Netherlands. A gorgeous example of one of Rolls-Royce’s most exceptional automobiles, it will surely attract lots of attention wherever it goes. 262 1929 Chrysler Series 75 Roadster CY7L €110,000 €130,000 $123,200 $145,600 Between 2011 and 2015, the Series 75 Roadster offered here was exhaustively professionally prepared for the Mille Miglia Storica and Le Mans Classic as a faithful recreation of the 1929 MM class-winning Leonardi/Barbieri car. Documented by over $100,000 US in invoices, it has undergone the fitting of a custom intake manifold with three restored Winfield carburettors and a new fabricated aluminium head. All-new brakes and chassis bushings were fabricated in addition to a suspension, an exhaust, a clutch, and ring-and-pinion gear, as were the five custom Borrani hubs and wire wheels. An extensive history file dating back to the 1960s details both the modern work and the car’s quiet life before competition preparation. Also included are the car’s factory steel bumpers, original artillery wheels, a fuel system, a carburettor and intake system, a folding top, and weather equipment. Having completed the 2012 Le Mans Classic, 2012 Grand Prix Nuvolari, and both the 2013 and 2015 Mille Miglias, the Chrysler is now ready for enjoyment by a new enthusiast! via RM Paris ’16 sold $147k. 263 1995 Ferrari F355GTS 103016 €60,000 €80,000 N/R $67,200 $89,600 Recent service by Charles Pozzi, Equipped with the desirable six-speed manual transmission, Quintessential Rosso Corsa over Nero leather interior, Rare, targa-topped GTS model 264 2002 Ferrari 575M Maranello 128466 €70,000 €90,000 $78,400 $100,800 Only 11,900 km from new, Wonderful colours of Argento Nürburgring over Blu Scuro, Italian-delivery example, Fitted with Ferrari’s F1-style gearbox 265 1996 Ferrari 456GT 100189 €60,000 €80,000 $67,200 $89,600 Le Mans Blue with Cream leather interior, A rare and desirable six-speed manual example, European specification and delivery with only 57,000 km from new, Fresh from service inspection with marque experts Riverside Performance Engineering with a new UK MOT 266 1997 Ferrari F355 Spider 108729 €70,000 €90,000 N/R $78,400 $100,800 Recently serviced by Charles Pozzi, Desirable manual transmission example, Less than 36,500 km from new, Delivered new to Switzerland 267 1970 Ferrari 246GT 00840 €200,000 €300,000 N/R $224,000 $336,000 This superb example was sold new in June of 1970 by Italcar in Turin, Italy. In 1975, it was shipped to Australia. There it was changed from its original LHD configuration to RHD in order to drive legally on the roads of that country. The Dino remained in Australia until November 1998 when it was exported to the UK, acquiring the registration ANM 275H in Great Britain. In 2002 the Dino was issued a new personalized registration of DAJ 12. In 2007 it was passed to a Belgium dealer, then to a German dealer and then to a private German collector in 2010. At some point, the car was repainted red and was converted back to LHD, although the exact date of the conversion is not known. The Dino’s current owner acquired the car in 2013 through a Dutch dealer. The Dino was treated to a high-quality restoration that included stripping the car’s body to bare metal and painting it back to Blu Sera Metallizato, just as it left the factory. According to its current owner, this stunning 1970 Dino 246 GT is properly sorted, ready to be enjoyed and an absolute pleasure to drive. 268 1970 Ferrari 365GTB/4 13183 €550,000 €650,000 $616,000 $728,000 Chassis no. 13183 was originally completed at Ferrari’s facilities in Maranello in February of 1970. It emerged from the factory finished in Rosso Chiaro (20-R-190) paintwork over a Nero (VM 8500) leather interior, built to left-hand-drive European specifications, equipped with the early Plexiglass nose, as well as power windows, a radio, knock-off Cromodora alloy wheels and the desirable factory air-conditioning. It would remain in its native Italy and was delivered to Romeo Pedini, Ferrari’s dealer in Perugia, Italy. Its first owner would be a Mr. Rossi, who purchased the car that same month. Registered under registration no. PG 157308, the car remained in Italy until at least 1973 prior to moving to Milan. At some point thereafter, it was exported to the U.S. and noted as being in the ownership of Avi R. Brand of Woodbury, New York, a small town north of New York City by 1979. In 1982 it was sold to an undisclosed owner who offered the car for sale with Graham Cox, Hallandale, Florida, and Motorcars International of Springfield, Missouri, in 1994. Ferrari Market Letter ads described it as ‘365 GTB/4, S/N 13183 (1970 Euro prod.). Red with tan interior. Plexiglass nose, Borrani wire wheels, factory a/c. Same owner since 1982. 38,409 miles. Extremely nice and original. Don’t miss this one.’ Another Ferrari Market Letter ad shows the car offered in California in April/May 1995; it was then sold to a collector in Japan later that year. Boasting an older restoration, the car received a recent cosmetic freshening and is presented today in its as-delivered colour combination. In December 2018, the Daytona was shipped to Joe Macari’s workshops in London, an authorized Ferrari aftersales service centre. There, the car received some service work, with the intention of bringing it in line for Ferrari Classiche certification. It was fitted with a correct type brake fluid reservoir and wood-rimmed steering wheel, amongst other minor items. Now granted Ferrari Classiche certification, the accompanying ‘red book’ states that it retains its original engine but is fitted with a replacement gearbox of the correct type. An icon of performance and engineering, the Daytona is a staple of any world-class Ferrari collection for its stunning good looks, impressive performance and grand touring capabilities. An early example now boasting Ferrari Classiche certification, this example would be a thrilling addition to any collection. 269 1999 Ferrari 360 Modena 124916 €60,000 €80,000 N/R $67,200 $89,600 Less than 10,000 km from new, Desirable manual transmission example, Presented in beautiful condition throughout and ready to be enjoyed, Comes with tailor-made car cover 270 1954 Jaguar XK120SE Roadster S676366 €80,000 €100,000 N/R $89,600 $112,000 Desirable ‘Special Equipment’ model with C-Type–style cylinder head, Stunning dark blue over beige colour scheme, Regularly serviced and maintained in current ownership 271 1959 Porsche 356A 1600 Coupe 106834 €120,000 €140,000 $134,400 $156,800 This stunning 1959 Porsche 356 A Coupé, amongst the final As produced, was delivered new to California. Though the earliest history is unknown, the ownership history since 1993 is fully documented. Beginning in 1992, when the car was first imported to Turin, it was owned by a Sr. Giuseppe Dalmas. In 2001, the car was then sold to Andrea Chiappa, who passed the car to the consignor in 2016. A full restoration was completed on the car at the end of 2018, and it is in exceptional condition throughout and fully ready for its new owner. Accompanying the car is the original California title, documentation confirming its importation to Italy, as well as correspondence from Porsche Italy which confirms the original equipment with which this 356 A left Zuffenhausen, namely U.S.-specification bumpers, sealed headlights and rear view mirror. It also confirms that the Silver Metallic paint applied at restoration is the original colour for the car. With its high level of restoration, documented history and superb presentation, this 356 A is an ideal addition to any collection of sports cars. 272 2013 Bugatti Veyron Grand Sport Vitesse VF9SV25223M795027 €1,500,000 €1,700,000 $1,680,000 $1,904,000 Instead of being built for a specific client, this Grand Sport Vitesse, Chassis no. 795027, is what makes it the most important motor show of the year, the Geneva Motor Show. Produced in early 2013 in Geneva on Bugatti’s stand-up a Grand Sport and another Vitesse. In the same veinron, exactly one year after the model was first launched, the Bugatti built this car to EU very tastefully in a fully exposed black carbon fiber over interior trimmed in two-tone Gaucho and Beluga Black leather and Bugatti Light Blue stitching. It also features a Blue Brush callipers, Brushed Aluminum exterior mirror, chrome horseshoe grille mesh, Vitesse wheels in a diamond finish, sport comfort seats, Bugatti Light Blue ‘Vitesse’ embroidered on the headrests and on the transmission tunnel, a painted interior rear view Mirror and door sill plates reading ‘Geneva Motorshow 2013’. After the conclusion of the show, the Veyron was delivered to Moscow, Russia, where it has remained ever since. 550 km from new and present in almost as new condition throughout. Truly a landmark automobile in all regards, no vehicle henceforth into the 21st century has been as highly sought after as the Veyron, and within the model’s hierarchy, the Grand Sport Vitesse stands proud as the Veyron to have. This example, with under 550 km on its odometer and Geneva engine show history, is certainly one of the best examples in existence. 273 2017 Ferrari California 70th Anniversary 226893 €275,000 €300,000 $308,000 $336,000 Of the 70 different liveries, the one worn by this California T is one of the later liveries, specifically ‘The Pinnacle’, which celebrated the LaFerrari. Externally, the car is painted in Rosso Corsa with a Nero roof, wing mirrors and door handles, and the wheels are painted matte black. Inside, the dashboard and steering wheel are covered in black leather while the seats and lower dashboard wear a high-quality Siam red leather with a fine grain designed to recall the bucket seats in the LaFerrari. The carpets are black mycroprestige, a high tech material, which was developed specifically for Ferrari that is soft to the touch. Carbon fibre trim can be found throughout the interior, including on the shifter paddles and the steering wheel. Delivered new to its first and only owner through Scuderia Monte Carlo, Ferrari’s official dealer in Monaco, it has only accumulated delivery mileage since new and remains in virtually as-new condition throughout. The California Ts boasting 70th Anniversary liveries remain the most desirable examples of their breed. Celebrating the race-breed nature of the brand yet comfortable and practical enough to be used on a daily basis, this California T would be an exciting addition to any collection. 274 2005 Ferrari 575 Superamerica 144858 €275,000 €325,000 $308,000 $364,000 The same gentleman owned the car for 11 years, during which he covered 23,000 km. In that time the car was serviced by Ferrari-approved dealerships in 2007, 2009 and 2015. The next registered owner acquired the car in March 2016 and has been using it sparingly since, covering just over 1,000 km. 24500 km on the odometer. Charles Pozzi in August 2018, and now offers less than 24,500 km on the odometer. Fittingly, the car is set with Rosso Corsa paintwork over Nero interior. It presents itself beautifully with a modular 19-in. wheels and discreet options that set it apart: a rosso tachometer, extended leather dashboard, daytona-style seats and a carbon fiber trimmed instrument cluster. There are few finer ways to cover ground than in the driver’s seat of front-engined V-12 Ferrari, whether that be attacking a twisting back road or devouring at autoroute. Revered for its supreme all-round capability, this 575 Superamerica delivers all the added thrill of open-air motoring. A true modern classic. 275 1999 BMW M Coupe WBSCM91030LB56838 €45,000 €65,000 N/R $50,400 $72,800 Desirable Estoril Blue over Estoril Blue and Black Nappa leather, 65,000 km from new, Delivered new to Japan, Retains its original owner’s manual and service book,Recent full service by current owner 276 2004 BMW CSL WBSBL95000JB98713 €80,000 €100,000 $89,600 $112,000 Purchased by its current owner out of Japan in September of 2017, where it has been imported to Poland, where it has remained ever since. The car has been brought to BMW for a service and has remained in storage well since then. More recently, it has been featured in the Polish BMW magazine BMW Trends. Furthermore, it comes with its original service book and a set of spare keys. Truly one of the most desirable BMWs built into the 21st century, the M3 CSL is a must-have automobile in any BMW collection, and this example will not disappoint. 277 1974 BMW 3.0 CS 4310286 €30,000 €40,000 N/R $33,600 $44,800 Finished in Sienna Brown over a beige leather interior, a spectacular color combination for one of BMW’s most memorable 1970s automobiles, this example of what’s new to the US, as evidenced by federalization tags present in its engine bay. The car remained in the US until at least 2011 before being purchased by the Youngtimer Collection. Serviced yearly in the consignor’s collection, the car’s last oil change was completed in January of 2019, and it has been driven sparingly since. Keen eyes wants to get some interesting modifications to this particular 3.0 CS. Zenith carburettors, this example sports three Weber carburettors. The car is also fitted with a five-speed manual gearbox, which only improves the 3.0 CS ‘already sublime driving experience, as well as Alpina-style multispoke wheels. Inside, the original steering wheel has been replaced with a wood-rimed Nardi wheel, adding a touch of class to the interior. Without a doubt, one of BMW’s most gorgeous designs, the E9 3.0 CS is just as exciting as it is to look at, and this example’s tasteful modifications make it even more exciting. 278 1990 BMW M635 Csi WBAEE110802285110 €50,000 €60,000 $56,000 $67,200 Finished in Alpinweiss II over a beige cloth interior, this M635CSi presents beautifully throughout, in accordance with its odometer reading 97,734 at the time of cataloging, clearly having been very well kept from new. Offering copious amounts of performance and practicality, a well-kept M635CSi would be a thrilling acquisition for any enthusiast of 1980’s performance cars. 279 1949 Veritas BMW racer 85123 €450,000 €550,000 $504,000 $616,000 The underlying 328 chassis found here bears no. 85123 and was supplied to Chany Wagner, a BMW dealer located in Luxembourg. According to marque specialist Martin Schroeder, the car was first registered in September of 1937 to Wagner. It was first seen with Honoré Wagner at a race in Eifel in 1951. Wearing racing no. 18 and entered as ‘Wagner Special BMW’, it finished 5th. At some point the car has been brought to Veritas, allegedly to be converted to RS specifications. This process was started but was sadly never completed prior to Veritas going out of business. It is thought that the car has been given to a French employee in outstanding payment. Unfinished at this time, the car was fitted with homemade bodywork and made its way to France. In 1978, Jürgen Sinkel, a respected historic racer living in Dusseldorf, found this car in Southern France in poor condition. At this time, it sporting a Talbot engine and a French Cotal transmission. Fuel filler caps were found next to the windshield mounts for side-mounted fuel tanks, a Veritas trademark. He removed the existing engine and gearbox, installing a Bristol engine and transmission in their place. Afterwards, the Anglo-Iranian collector Fuad Majzub, but the car remains in Dusseldorf until at least 1990, and the car to be transported to BMW and Bristol. of Westbury, Wiltshire, for a complete restoration, which included painstaking recreation of Veritas RS bodywork. Purchased by German Enthusiast Claas Werner in 1995, the Restoration at TT Workshops began in October of that year and was finally completed in the Spring of 1998, at a cost of almost £ 100,000. The sparetime use by Werner in events such as the Eifel Classic, the car was purchased in 2000 by the current owner, who uses it extensively in events as diverse as the 2008 Monaco Grand Prix Historique, 2008 Angouleme Circuit des Remparts and 2012 Eifel race. Graber Sportgarage AG of Toffen, Switzerland. During his / her last-day racing career, he / she continued. As with many 1950s sports racing cars-and especially those powered by the wonderfully tractable BMW engine chassis no. 85123 remains an extremely versatile and usable car, equally at home on either road or track. Eligible for a wide range of motoring events, including the Monaco Grand Prix Historique, Mille Miglia, Colorado 1000, Goodwood Revival and the Royal Automobile Club Woodcote Trophy, it remains a rare, charismatic and highly significant example of early post-war German engineering. 280 1997 Bentley Continental T SCBZU23C3VCX53432 €70,000 €80,000 $78,400 $89,600 This stunning Bentley Continental T was originally sold to Japan via official importer Cornes and Co in 1997. It would remain in Japan until 2015 when it was exported to Europe. This Continental T was subsequently exported to Switzerland in 2017 after being purchased by the consignor. Finished in dark red over two-tone beige leather, it presents very well throughout. The Continental T harks back to the glory days of Bentley and represents an excellent introduction to the marque for potential owners. 281 1990 Rolls-Royce Corniche III SCAZD02DXLCX30018 €50,000 €60,000 $56,000 $67,200 This Series III Corniche was originally delivered to the U.S. and was at some point exported to Japan. It remained there until 2016 when it was purchased and exported to Switzerland by the consignor. Accompanied by its original owner’s manuals, its gorgeous “triple white” with red carpets and piping exudes luxury and presents beautifully throughout, perhaps the perfect colour scheme for places like the French Riviera or Miami Beach. The most luxurious convertible in the world upon its release, this Corniche III would make the perfect companion for relaxing, roof down summer drives. 282 1990 Mercedes-Benz 560SEL WDB1260391A552760 €30,000 €35,000 N/R $33,600 $39,200 This particular example, originally produced for the Middle East as a 560SEL long-wheelbase sedan, was customized by extending the chassis to another in. Syria and unfortunately, further ownership of history is not known for certain. United Kingdom Emirates, a service day in the door jamb shows that it was serviced at 570 km in June 2003 by the Dubai Government Workshop. It was purchased by the current owner in Bahrain in early 2016 and shipped to Switzerland, where it has remained ever since. Today, it is in an excellent condition and would be interesting to acquire any collection. 283 1994 Porsche 928GTS WP0ZZZ92ZRS800519 €80,000 €100,000 $89,600 $112,000 Delivered new in Germany in 1994, this 928 GTS is finished in black over a black leather interior. Pioneer radio system and telephone, against wheel arches and sunroof. 5,700 km as of June of 1997, alluded to being exported to Switzerland in 2015, it has been exported to over 20 years. This well-kept example would surely be one to treasure. 284 1998 Mercedes-Benz SL600 WDB1290761F155349 €20,000 €25,000 N/R $22,400 $28,000 Delivered new to Japan, this R129 model was ordered in Black paint with black leather and a soft top and hard top – a combination of still retains. Although little is known about its Japanese history, it is clear that the SL 600 has been driven, the car remains in well-preserved condition throughout. In 2017 the SL600 was purchased by the current owner and added to his astounding Mercedes-Benzes collection – where it was lovingly preserved. Rarely are R129s found having this level of care and attention; for the marque enthusiast this vehicle is a no-brainer. 285 1993 Mercedes-Benz S600 WDB1400761A159856 €15,000 €20,000 N/R $16,800 $22,400 This rare twelve-cylinder S600 was delivered to Japan in 1993 and specified in blue-black metallic paint over a black leather interior, with a range of options, including electric roller blinds for the rear window. It was exported from Japan to Germany through its current owner in 2015. Considered ahead of its time, the W140 family of Mercedes Benzes still boast features that have become mainstream automobiles of today. Presented in wonderful condition throughout, this S600 would be silent on the open road today. 286 1996 Mercedes-Benz S600 AMG WDB1400761A317701 €25,000 €35,000 N/R $28,000 $39,200 Finished in Polar White over exclusive-department Mushroom leather, it was originally delivered to Japan in March 1996, where it resided until 2017, when it was exported to Switzerland by its current owner. This is a true wolf in sheep’s clothing, from an era when Mercedes-Benz set the standard in automotive engineering and innovation. 287 1964 Mercedes-Benz 300SE Coupe 112.021.10.006379 €15,000 €20,000 N/R $16,800 $22,400 A desirable restoration project, Factory left-hand-drive example, Equipped with a manual transmission, Accompanied by a tailor-made car cover 288 2008 BMW M5 WBSNB935X8CX10182 €25,000 €35,000 N/R $28,000 $39,200 Delivered to the US East Coast, this example of the six-speed manual and finished in Alpine White Portland Brown Merino leather. The car passed through owners in New York, California and Texas before being purchased in Texas by its current owner in 2016 and exported to Switzerland. Today, it shows under 63.100 km (less than 39.209 miles) from New on its odometer and presents well throughout. Manual transmission-equipped E60 M5s are a rare sight in Europe and continue to be sought after by enthusiasts worldwide. As such, this example should not be overlooked. 289 2001 Mini Cooper S SAXXNPAZE1D188526 €25,000 €30,000 N/R $28,000 $33,600 Adding to this example’s desirability, a plaque is present inside the car proclaiming it as one of the last 500 built to the original Sir Alec Issigonis design. Born as an RHD-specification example with a manual transmission and the 1275 MPi engine with a 10.1:1 compression ratio, the car was later converted to LHD specifications. Finished in dark green with silver stripes, the interior is trimmed in black and silver leather. It has been very well preserved and maintained in the Youngtimer Collection, having received a full service in January of 2018 with a single mile accumulated since. Nothing short of an automobile icon, every enthusiast deserves to own an original Mini, and an example with less than 350 miles from new should not be passed by. 290 1991 BMW 850i WBAEG21000CB05485 €30,000 €40,000 N/R $33,600 $44,800 This lovely example was delivered new to Japan in 1991, where it remained until it was exported to the UK. It was subsequently bought by the consignor and imported to Switzerland in 2017. With its unique styling and high-speed cruising capability, this E31 is perhaps one of the best collectors’ BMWs you can buy at this moment, thanks to BMW’s unveiling of the new G15 8 Series with production and sales beginning late last year. With the combination of the distinctive ‘silky smooth’ 5.0-litre V-12 engine and four-speed automatic transmission, this 850i is ready to bring the thrill of the finest modern motoring in a very contemporary fashion. 291 2000 BMW Z8 WBAEJ11090AF77630 €165,000 €185,000 $184,800 $207,200 This EU-specification Z8 was first delivered in June 2000 to BMW Andorra to its current British owner. Not only is it noteworthy for being a one-owner example, but it also boasts a full service history with authorized BMW dealers. In 2018, the car was imported to Spain where it has been kept at the owner’s residence in Mallorca. Specified in Titanium Silver with black leather trim, it presents itself in a perfect condition and is accompanied by its matching hard top and previous service invoices, which testifies to its fastidious upkeep. BMW’s shining star celebrates into the 21st century, the Z8 was the perfect halo car for the company and earned a number of passionate fans from its starring role in the James Bond movie The World Is Not Enough. Now over 20 years since its design as a concept, the Z8 has been aged exceptionally well and is truly a modern-day classic in every sense. 292 1992 Porsche 911/964 Carrera RS WP0ZZZ96ZNS491596 €180,000 €230,000 $201,600 $257,600 Delivered to its first owner in Germany on 17 March 1992, this case resided with him in the hands of a Swedish owner in the late 1990s. It has since been two further owners in Sweden. The car has been received in its lifetime. Retaining its original engine and gearbox, the car’s black paintwork retains a deep shine, while the engine is in the engine bay. Inside, the car is conspicuous for its fantastic black on triple-tone purple color scheme, as well as its beautiful unmolested condition. Its owner’s manuals, original, complete kit and tire inflator accompany the sale. Undoubtedly one for the connoisseur, the 964 RS has rightly become one of the most sought-after 911s. This truly cherished example would be an excellent addition to any collection, perfect for those looking to experience one of the ultimate air-cooled 911s. 293 1996 Lamborghini Diablo SE30 ZA9DE22A0RLA12036 €395,000 €495,000 $442,400 $554,400 This SE30 has only 403 km of new and beautiful new items, and the original factory books and tools accompany the car. Finished strikingly in titan silver metallic with a contrasting black and gray interior, this Lamborghini is stunning both in style and condition, presenting a rare opportunity to acquire one of the most desirable and lowest-mileage examples of this coveted supercar in existence. 294 1968 Maserati Sebring 4.0GT Series II AM101/10673 €175,000 €225,000 $196,000 $252,000 This car was imported by Thepenier Maserati and would be the last Maserati Sebring imported to France. The original sales invoice from delivery to its first French owner accompanies the car. It has only had three caretakers since new. Recently, a comprehensive engine rebuild was completed in 2017 by Performance Plus in Longnes, and a complete overhaul of the fuel injection system was done by specialists at Power Props. A highly original car, including interior, this rare car possesses a striking colour scheme while maintaining a lovely patina. With recent and substantial mechanical work completed, this rare and desirable, matching-numbers Series II Sebring is a highly usable Maserati ready to be enjoyed. 296 1989 Ferrari 412 82116 €80,000 €100,000 $89,600 $112,000 This past year of production example of the Ferrari 412 was delivered with the desirable manual gearbox. Restored in beautiful silver paint over a brown leather interior, the car previously resided in Italy prior to being imported to Switzerland with its current owner. The perfect entry-level Ferrari for any enthusiast with a family of four, a 412 is perfect for extended road trips and a great way into twelve-cylinder Ferrari ownership. 297 1979 Mercedes-Benz 500TE AMG 123.190.12.010043 €60,000 €70,000 $67,200 $78,400 AMG was far from a household name in the late 1970s and early 1980s, but the firm had established an excellent reputation for modifying Mercedes-Benzes. One of their earliest and most celebrated conversions was fitting the W123 chassis with a 5.0-litre V-8, costing a whopping 65,000 Deutsche Marks. It is rumoured that only a pair of wagons, sedans and a single coupé were converted. While its early history is not known, this example was discovered in early 2013 by Henric Nieminen, a California-based AMG enthusiast. The previous owner was not aware of the history of the car but after seeing it in person, it was far more special than the ad let on. The intrigue increased after inquiring with Mercedes-Benz. The very early M117 5.0-litre V-8 fitted to the car was found to not have been allocated to any specific chassis, yet boasted tubular headers, downpipes, secondary oil cooler and motor mounts custom designed to fit the W123 wagon’s engine bay. The car also retained a full AMG body kit, OE skid plate, cast aluminium rear suspension, date-stamped 1979 Recaro seats with upholstery that matched the door cards, taxi upper console for additional gauges and other hallmarks indicative of an early AMG conversion. The sum of these parts suggests the car was built in period by either AMG in the United States, or by someone who had intimate knowledge of Mercedes-Benz and AMG products at a time when few people would have had such knowledge outside AMG. However, there is no conclusive proof or documentation to support this. The car was cosmetically refreshed over the course of 2013 and retained by Nieminen for the next four years. Interestingly, it was used by BBC America’s Top Gear America in a segment, celebrating 50 years of AMG. In 2017, it was purchased by the consignor and imported to Switzerland, where it has remained ever since as one of the highlights of his collection of pre-merger AMGs. 298 1984 Mercedes-Benz 500SEC AMG 5.4 Wide body WDB1260441A017380 €90,000 €100,000 $100,800 $112,000 This particular example features many AMG upgrades that make it unique, including the extremely rare ‘widebody kit’, AMG instrument dials and AMG steering wheel. The engine has also been bored out to 5.4 litres by the engineers at Affalterbach, increasing power to 310 bhp, enabling a 0–60 sprint of 6.7 seconds and a top speed of 155 mph. Painted and trimmed in black with black accents, this is a fine example of a pre-merger AMG ‘muscle car’. Its scarcity and low indicated mileage make this W126 very special indeed. 299 1960 Jaguar XK150 3.8 DHC S838847DN €110,000 €140,000 $123,200 $156,800 Chassis S 838847 DN rolled off the Brown’s Lane production line in May 1960 with the desirable 3.8-liter engine and manual overdrive gearbox. The car was built in left-hand-drive configuration but as a personal export car, initially registered in Coventry as ‘5754 DU’. The car’s first owner, Mr Frost FW, of New Hampshire, collected the car and embarked on a journey to the US in the autumn of 1960. Pictures of the car in 2009 show that it is. Over the course of the following decades the car has a sheltered life, being dry stored for some years which in remarkably original condition. The car has been re-painted and re-trimmed in the original color combination by a well-known UK Jaguar specialist. 300 2018 Italdesign Zerouno ZA9EC1018HTM09004 €950,000 €1,500,000 $1,064,000 $1,680,000 Each of the five made-to-order examples is customizable to suit the owner’s requirements: from the choice of materials to the development of a bespoke paint color code. Zerouno new is certainly no stranger to bespoke supercars. Those familiar with both modern supercars and social media want to be aware of @mwvmnw on Instagram, a sizeable private collection regularly showcasing many of the finest supercars and race cars. He was lucky enough to purchase the fifth and final example of the Zerouno, who made several unique touches to his request. Having only accumulated testing and delivery mileage, this example has never been registered for road use and is presented in virtually ‘as-new’ condition. Its new owner will surely enjoy a fantastic opportunity to become a unique example of a contemporary coachbuilt supercar. Turinese automotive knowledge. This is a unique blend of modern styling and engineering. 301 1958 Cadillac Eldorado Biarritz 58E024804 €125,000 €165,000 $140,000 $184,800 This stunning Dakota Red Eldorado w / white convertible top was originally delivered to Texas. It was a photo-documented, body-off restoration there in 1996. At the time, it was fitted with a proper red and white Jenkins leather interior. A copy of the restoration portfolio is available upon request. In 2001 the car was sold to a Dutch businessman who had a collection of American convertibles. Under his ownership, the car was used sparingly, and due to his age, he chose to sell the car and it was purchased by the current Belgian owner in 2015. In addition to the standard power steering, brakes and windows, this Cadillac confirms this option with electric door locks, air conditioner, EZ Eye glass and Autronic Eye. Adding to driving comfort, a period-looking AM-FM stereo radio is discreetly hidden in its proper in-dash location. This is the 1950s American automobiles. 302 2007 Wiesmann GT W09GT12017DW59096 €170,000 €200,000 $190,400 $224,000 This GT was delivered in Germany in 2007 and presents in excellent condition today. Its bright red paintwork gleams beautifully, the hand-stitched leather interior and quilted seats show at least. Featuring matching cream instrument dials, red stitching and its original Becker Grand Prix stereo system, it boats a tasteful specification that suits the car’s character perfectly. Despite being entirely hand-built, the fit, finish, and exclusivity of the Wiesmann GT makes it a very serious proposition, and it would be an excellent alternative to a Porsche 911 Turbo or an Aston Martin DBS for someone desiring something a bit more unique. A tantalizing combination of classical aesthetics underpinned by the finest engineering on offer from BMW; attributes worthy of the attentions of any collector. 303 1991 Bentley Turbo RL SCBZP03A0MCX35172 €30,000 €40,000 N/R $33,600 $44,800 This pristine example was delivered to Japan in March 1991 as evidenced by the Cornes & Co., Ltd. plaques on its doorsills. Beautifully finished in dark blue over a beige leather interior, it also sports matching beige pinstriping on its exterior. Exported to 2016 to Europe, it has been acquired by the consignor in Germany approximately one year ago and remains in an exemplary condition throughout. 304 1987 Rolls-Royce Silver Lane SCAZN02A7HCX20847 €30,000 €40,000 N/R $33,600 $44,800 CARFAX report shows that it resides in New Jersey as of March of 1988. It was specified in ebony, with a magnolia interior and black piping. In the mid-2000s, it resided in Florida prior to moving to Nevada where it was exported to Germany in 2009 before being purchased by the current owner in 2017 and exported to Switzerland. With separate air conditioning front and rear, it provides a refrigerator and ambient lighting, making it an ideal car to drive in, rather than driving one’s self. 306 1992 Porsche 968 WP0ZZZ96ZNS802014 €20,000 €30,000 N/R $22,400 $33,600 This Guards Red 968 was delivered to Otto Glöckler Porsche in Frankfurt in 1992. The car’s current mileage is 20.164 km away. It shows regular service throughout its life in the Frankfurt area in its service book. It was imported into Switzerland in 2017 and imported to Switzerland, with its last service stamp showing that it was serviced in Switzerland in February of 2018 at 20.147 km. In accordance with its low mileage, the car presents in wonderful condition throughout, undoubtedly due to careful preservation by its previous custodians. 307 1991 Rolls-Royce Silver Spur II SCAZN02AXMCX35143 €20,000 €25,000 N/R $22,400 $28,000 Corners & Co., Ltd., this Mulliner trace retains its original color combination of bordeaux paint over magnolia with red piping and carpets. According to its Japanese Export Certificate, it was first registered in April 1991. Twenty-five years later, the Rolls-Royce was purchased by the current owner. Since then, it has been carefully maintained and preserved. Accompanied by its original Japanese owner’s manuals, this Silver Spur II is sure to provide a smooth and comfortable ride to the next lucky owners. 308 1973 Porsche 911 Carrera RS 2.7 Touring 911 360 1296 €450,000 €550,000 $504,000 $616,000 In total, 1,590 examples were built (including ‘Homologation’, or ‘H’ cars) and sold. Today, the 1973 911 Carrera RS 2.7 is one of the most coveted sports cars on the planet. Sold new to Italy with a Grand Prix white exterior and blue Carrera script over black leather, the car is currently fitted with the desirable Recaro sport seats. Presented today in excellent condition, this 2.7 RS Touring retains its original engine and gearbox and has covered just over 24,000 km throughout its life, which are believed to be original. With the 2.7 RS, many enthusiasts believed that Porsche achieved perfection. Beautifully balanced in terms of both driving dynamics and design, the 2.7 RS today remains the quintessential model of the original 911 and over 45 years after its original introduction, it is still considered to be one of the best road-going Porsches ever built. Finished in its original colours and boasting its original engine and gearbox, this is a 2.7 RS to cherish. 309 1983 Porsche 911 Turbo Group 4 WP0ZZZ93ZFS000993 €160,000 €200,000 $179,200 $224,000 This Porsche was constructed by noted Belgium Porsche specialist BSM Salewsky. Starting with the tub of a 1983 930 Turbo, it was carefully assembled to 1978 Group 4 specifications and comes with current FIA papers. This very special Porsche has been raced regularly in recent years by three-time Le Mans winner and racing icon Klaus Ludwig. It has participated in the Youngtimer Trophy from 2014 to 2017, the Oldtimer Grand Prix in 2015, 2016 and 2018, won the Group 4 category at the 2017 Meilen Trophy, was driven in the Le Mans Classic in 2018 where it ran Plateau 6, as well as the 24 Hour Classic Race at Nürburgring in 2018. The engine is fresh with zero hours on it and the car is up to date with current racing regulations and ready for the track. This Group 4 car is also road registered, making it eligible for a wide variety of vintage motorsports events. 310 2007 Ferrari F430 Spider 156792 €120,000 €160,000 $134,400 $179,200 This wonderful example was first delivered in March 2007. Specified in Bianco Avus over Nero leather with white stitching, it presents in fine condition having covered just under 37,000 km to date. To ensure maximum aural enjoyment with the roof down, an upgraded exhaust system has been fitted, whilst the interior benefits from Daytona-style seats and carbon-fibre trims from the factory. The service booklet shows five stamps, all at Ferrari-approved specialists, with its most recent service being in July 2018 at Cavallari Motors of Monaco, since which the car has covered just 500 km. The car is accompanied by its full suite of owner’s manuals, service book and tool kit. Manual transmission-equipped F430s are highly prized items, with the Spider being arguably the pick of the range for ultimate thrills. This example is no exception. 311 2010 BMW M5 WBSNB9C58AC043215 €35,000 €40,000 N/R $39,200 $44,800 According to the accompanying original window sticker, this manual transmission-equipped M5 was finished in Silverstone metallic paint over a Silverstone II Merino Leather interior with Maderia Walnut wood trim. The only optional extras equipped were rear sunshades, an iPod and USB adapter and the enhanced premium sound system. Delivered new through BMW of the Hudson Valley in Poughkeepsie, New York, the car remained in upstate New York until it was purchased by the current owner in 2016 and exported to Switzerland. Today, the car remains in excellent condition throughout, showing less than 45,300 km (less than 28,148 miles) from new. In addition to the aforementioned window sticker, it is accompanied by its original owner’s manual. Seldom seen in Europe, manual transmission-equipped E60 M5s have been highly sought after by enthusiasts and collectors since they left the factory. Low-mileage examples are becoming increasingly more difficult to find, and this example checks all the right boxes in terms of desirability. It would be a prime addition to any collection of supercars or BMW M cars. 312 1992 BMW 850i WBAEG21030CB06291 €40,000 €50,000 N/R $44,800 $56,000 This 850i, now offered for sale, was delivered to its first owner in Japan in 1992, where it resided until being purchased by its current owner and exported to Switzerland in 2016. It is bestowed with BMWs first-ever production V-12, which can produce 295 bhp alongside a weighty 450 nm of torque, its silky-smooth power delivery the perfect partner to the GT characteristics of the chassis. Specified in a suitably elegant colour scheme of Mauritius Blue over silver grey Nappa leather, this would be a wonderful acquisition for the enthusiast looking to drive and enjoy one of BMW’s great super coupés. 313 1989 Ferrari 328GTS 78821 €70,000 €90,000 $78,400 $100,800 This Ferrari 328 GTS was purchased by the consignor in 2015 and exported to Switzerland from Germany that same year. Delivered in classic Rosso over a Crema interior, this 328 GTS would be an excellent acquisition. 314 1988 Porsche 928 Koenig WP0ZZZ922JS841040 €50,000 €60,000 $56,000 $67,200 According to the consignor, this Middle Eastern-spec 928 was converted with a Koenig widebody kit into period, boasting rear fenders and massive BBS wheels and was purchased by the consignor from an owner in Bahrain. Invoices from Porsche Center Kuwait in 2017 are on sale and at this time, the car has been fully restored at a cost of over € 14,000 that included a full repaint and the fitment of a new windshield. Additionally, it was received at the consignor’s collection in February of this year and has not been driven since. Finished in black with a gray leather interior, the car presents exceptionally well both inside and out, with its odometer showing 17,118 km at the time of cataloguing. It would sit proudly alongside any BMW Alpina or AMG-modified Mercedes-Benz of the same period, as it has in the Youngtimer Collection for the past few years. 315 1970 Monteverdi 375/4 Saloon 3007 €200,000 €240,000 $224,000 $268,800 Chassis no. 3007 is a highly original early production example of a fresh cosmetic freshening product, including a re-spray in striking dark metallic eggplant. According to the consignor, the grille, the bumpers, and the window surrounds all present in good order and the body features straight, crisp panels. The car retains the correct cast-alloy center-lock wheels made specifically for these cars. Inside, you will find the original dash, console and perforated headliner, all of which remain in very good order. The biscuit leather seats and door panels are in excellent condition, as are the aubergine carpets which provide a pleasing complement to the body color. A rear seat Sony 6 “television resides in a custom leather-trimmed console while up front, the original radio is fitted. Adding to the comforts of this disco-era executive express are power steering, air conditioning and cruise control. Under hood, the distinctive Monteverdi valve covers are in place, and the presentation is highly original, yet very detailed and very neat. Tidy, and all is in good order as well. Low production numbers, exclusivity and a powerful, reliable American powertrain combine with excellent cosmetics and sound mechanicals to make this an intriguing super saloon worthy of consideration. 316 1998 Mercedes-Benz CL600 AMG WDB1400761A405012 €20,000 €25,000 N/R $22,400 $28,000 Believed to be one of just 24 7.0-liter versions built, this example has been issued in both Europe and Japan, 2016. It retains its factory specification of Neve white with exclusive black leather, as well as all of its AMG upgrades. Not for the fainthearted and with a power good for Horacio Pagani’s Zonda supercar, this is no ordinary Mercedes. 317 1996 Mercedes-Benz S600 WDB1400761A302277 €20,000 €25,000 N/R $22,400 $28,000 Delivered to Japan and wear the same Brilliant Silver Metallic over two-tone gray color scheme that will bore when new, the car remains in Japan until 2014 when it was shipped to Europe. Purchased by the current owner two years ago and imported to Switzerland, it remains in excellent condition throughout. Sharing the same wheelbase as the four-door S-Class sedan, the coupe can easily transport four passengers, and makes a lovely alternative to its four-door sibling. 318 1988 Mercedes-Benz 560SL WDBBA48D3JA090520 €50,000 €60,000 $56,000 $67,200 Texas, 2013, the 560 SL was offered again shortly thereafter, with a recorded odometer reading 21,694 miles. Once in Texas, the 560 SL remained in that state for three years before being exported to Switzerland when purchased by the current owner in 2016. At that time, the odometer had only 21,802 miles and has been accrued approximately 60 miles since. The low-mileage Mercedes-Benz 560 SL is as beautiful as it was in 1988. 320 1995 Porsche 911/964 Carrera RS WP0ZZZ99ZSS390129 €225,000 €275,000 $252,000 $308,000 This particular Carrera RS Clubsport was delivered to March 1995. Additional options include a strong battery, radio delete, dome strut, fixed spoiler with additional wing, windscreen tint, air conditioning and cloth / leatherette seats. The original service book states the car was delivered new to Porsche Center Ulm and was serviced twice by the supply dealer. In 1997 the car was sold to a buyer in Jersey before being acquired by the current private collector in September of 2006. Finished in Guards Red (G1) exterior paint, this example has been maintained at regular service intervals. A speedometer change took place in 1998 when the car was exported from Germany at 23,000 miles (37,000 km) and is now showing 42,542 miles (68,464 km), making the total mileage approximately 105,000 km. This extremely rare club sport is now ready for a new custodian and is a highly versatile modern classic that is at home on the road or track. 322 1990 Rolls-Royce Silver Spur II SCAZN02D9LCX32646 €20,000 €25,000 N/R $22,400 $28,000 Finished in Acrylic Graphite with a Grey roof, this Silver Spur II was upholstered in the pleasing combination of parchment leather with grey piping and with shale grey carpets. Optional extras included under-dash trim and a radio, whitewall tyres and the beautifully subtle covering of the steering wheel in black leather. Shipped to T & K Exports of El Monte California, the Silver Spur touched American soil on 23 April 1990 with a reported mileage of 176 miles. The car was likely shipped to Japan shortly thereafter, as it was ordered by Cornes Motors, and the export certificate on file shows a first registration date of October 1990. In December of 2014 the Rolls-Royce was exported to Germany, where it remained until purchased by the current owner in 2017. Residing in Switzerland ever since, this Silver Spur has been well maintained and presents beautifully. 323 1984 Nissan 300ZX Turbo 50th Anniversary JN1CZ14S5EX010593 €20,000 €25,000 N/R $22,400 $28,000 This 50th Anniversary Edition was delivered with the automatic transmission, possibly easier for the driver with so many electronic controls to focus on. Delivered to the US, it remained there until 2007 when it was imported to the United Arab Emirates, according to a CARFAX report on file. Ten years later, it was exported to Switzerland by the current owner. Alongside the Shiro Special, the 50th Anniversary Edition models remain among the most desirable iterations of the Z31-generation 300ZXs, looking forward to Nissan’s bright future. 324 1916 American LaFrance 14 Litre Roadster 3652 €100,000 €125,000 $112,000 $140,000 Chassis no. 3652 was imported into the UK from Nyack, New York, by Cameron Millar in 1980. “The right-hand-drive configuration was retained , what its 14-liter six-cylinder engine, three-speed transaxle, dual chain drive and braking system. Bentley 8-liter hubs were fitted to allow the use of Rudge-Whitworth wire wheels providing a more sporting countenance. Upgrades include a Laid 12-volt Alternator (the original Dynamo remains in place but is bypassed) along with a full set of instrument gauges and Brooklands-type exhaust. Rolls-Royce specialist Graham Neale crafted the two-seat, boat-tail roadster body which offers a full tonneau cover and open storage behind the rear seat with access to the spare tire. This unique vehicle was invited to VSCC happenings in 1989 and 1996, including the Club’s Madresfield event. It would certainly be a thrill to drive and enjoy in future events. 325 1986 Porsche RUF BTR Flachbau WP0ZZZ93ZGS000234 €225,000 €275,000 $252,000 $308,000 Only three BTR Flatnoses are believed to have been produced by RUF, this example being one of 948 930 Turbo Flatnoses manufactured by Porsche and then converted in period by RUF, resulting in a car which evokes memories of the legendary 935. Delivered new to the Netherlands before being imported to the UK in 1989, this RUF was owned by one collector for 17 years and is presented today in excellent condition with updates including 996 GT3 Clubsport seats, RUF 4-point harnesses and a RUF steering wheel. Currently showing just over 42,800 km from new, this RUF has a comprehensive service history and has been subject to a full inspection at RUF at Pfaffenhausen in 2017. An extraordinarily rare opportunity to own a BTR ‘Flachbau’, this RUF would sit very well in any Porsche or RUF collection, especially for a collector wishing to stand out from the crowd. 328 1969 Porsche 911S 2.0 119300279 €160,000 €200,000 $179,200 $224,000 The example offered here was delivered new on 7 November 1968 to Porsche Dealership Hahn Sportwagen of Stuttgart finished in stunning Blood Orange. The first owner was a Mr Deleplace from Paris, France, who owned a Bosch centre in Paris that specialized in mechanical fuel injection. He enjoyed the car for the following three decades, until 1999, when he sold it to a Mr Van de Kerckove who then went on to sell it to the current owner in 2004. In late 2018, it was serviced at an authorized Porsche dealership in Lyon where it benefited from an oil and filter change, brake circuit overhaul including a new brake master cylinder and four new Michelin tires. Very rarely does the opportunity arise to acquire a largely original, early 911 like this one. Always been regularly maintained but never restored, it has only travelled a total of 129,500 km from new and is ready to be enjoyed by its fourth owner. 329 1957 Porsche 356A Speedster 83653 €275,000 €325,000 $308,000 $364,000 This particular Speedster was acquired by his current custodian 22 years ago while he was residing in Canada. Previously owned by members of the Toronto 356 club included Mr. A. Wichmann who sold this car to Mr. I. Blackstone in 1991. Walt MacKay Racing (who was recognized in the VARAC hall of fame for 40 years of racing Porsches and Elvas) to have their chassis and engine prepared for fast road. A later, 1,600-cc engine from 1965 356 C fitted with crankshaft drilled and tapped for full flow oil system, oil cooler, Elgin Camshaft and flywheel lightened to 6.3 kg producing over 100 bhp. The chassis benefited from Koni Dampers, a world champion roll bar and a double braking circuit. All invoices for this work are on file. When the current owner moved back to France in 2000, he rang the car with him and it has been used since then for rallies and club events. Stunning for its originality, renowned for its pedigree and lineage and rare for its limited-production numbers, this fabulous 356 A 1600 Speedster ticks all the right boxes. A Porsche icon, the Speedster offers the ultimate top-down touring experience and instant recognition at shows and Porsche club events. 330 1962 Jaguar E-Type Series I 3.8 Roadster 877237 €170,000 €200,000 $190,400 $224,000 This example left the Browns Lane factory in May 1962 destined for California, ordered as a personal export delivery in black with red leather interior. It features the internal bonnet locks that denote a full production Series I. It remained in the U.S. registered in California with its first owner for nearly 30 years until 1991. At that point, it returned to the UK where it remained for only a while before then being registered for road use in Milan, Italy. The car underwent an extensive restoration with marque specialists that faithfully kept to the car’s original specification, including the 15-in. wire wheels. Even the engine wears the correct Harvest Gold enamel. Furthermore, it is accompanied by an extensive history file, chronicling its history in both North America and Europe. Today, this E-Type retains features including the correct optional hardtop, correct tyres and period Motorola 818T radio. It has been used as a reliable European tourer to destinations including the Goodwood Festival of Speed. This timeless GT is ready to take its new owner across continents in style. 331 1970 Mercedes-Benz 280SE 3.5 Coupe 111.026.12.002578 €100,000 €150,000 $112,000 $168,000 This handsome 280 SE 3.5 has been the subject of caring stewardship and restoration, presenting superbly in silver with a contrasting and sumptuous dark brown leather interior. Becker Europe radio, individual front seats, with automatic antenna and fog lamps, as well as the highly desirable electric sunroof option. A pleasure to drive, this impressive coupé is a great way to experience the legendary, opulent, and powerful 280 SE 3.5, a model that carries the distinction of being one of the marque’s most highly prized models of its generation. 332 1962 Alfa Romeo Giulietta Sprint AR350213 €60,000 €80,000 $67,200 $89,600 According to the information provided by Alfa Romeo Centro Documentazione, this original Iseo Light Blue Giulietta Sprint with chassis no. AR 350213 and engine series AR 00102 was manufactured on 15 February 1962 and sold on 6 March 1962 at Alfa Romeo Inc., Newark, USA , It is believed that this gorgeous Dolce Vita sports car has spent most of its life in Los Angeles in California until it was sourced and imported to Holland about 10 years ago. Sometime, during this time at the Golden State, the car has been repainted and has been done. The car was fitted with an earlier-type five-speed gearbox, either a transplant or a period conversion made with a factory-offered kit. The body of this Alfa Romeo did not benefit from the favorable climate and survived more than average. Together with the rare original iconic color and original engine, this sprint. In 2014, he decided to bring back to her glory with some reversible upgrades for more reliable daily use. Solex PAIA carburetor instead of the solex APAI-G. Several parts, like the original dynamo, Alfa Romeo workshop where all technical parts were inspected and serviced. All paint layers except underbody-coating were mechanically sanded from the body to bare metal. This revealed that the wings were absolutely spotless. The surfacing sheet-metal issues like replacing the boat floor were professionally addressed. After the body had been prepared and resprayed, the reassembly was reconditioned with the original parts. The list is too long to mention. As an example, the new wiring harness was sourced from the original parts supplier in Italy, as were the rubbers for the Carello headlights. The brightwork was polished and the original radiator grille parts re-chromed. Once the car is back together, a well-known Dutch rally car preparer thoroughly tunes the engine and proficiently sorted by issues. Photos and documentation about this work are available on file. This charming, light blue head turner starts on the button and is an absolute pleasure to enjoy with her nimble spirit. 333 1988 BMW 635CSi WBAEC890400766776 €40,000 €50,000 N/R $44,800 $56,000 Delivered new to Japan, this 635 CSi remained there until 2017 when it was exported to Switzerland by its current owner. It boasts the larger 3.5-litre, M30B5 engine introduced for the 1988 model year, which produces 208 bhp and 305 nm of torque. Finished in a dark grey over a black leather, it sports the optional four-speed automatic transmission. Perhaps the perfect candidate for the enthusiast looking for their first collector car, the 635 CSi provides both exciting performance and enough practicality to be used on a daily basis, and this example surely will not disappoint. 334 1955 Cadillac Eldorado 556285676 €85,000 €110,000 $95,200 $123,200 This Cadillac was originally delivered to California and remains in the US by its current, Belgian owner. The recipient of a body-on in 2014, it has a new leather interior which was done by craftsmen in Belgium. This is an excellent example of mid-fifties American design that would attract attention where it goes. 335 1994 Porsche 911/964 Turbo 3.6 WP0AC2962RS480364 €150,000 €180,000 $168,000 $201,600 Built in October of 1993, this 911 Turbo 3.6 was delivered new to the U.S. An accompanying CARFAX report shows that the car was first registered in Alabama before moving to Oklahoma the following year. By 1996, the car moved north to Pennsylvania, where it remained at least until 2006. By 2013, the car had been exported to Kuwait. There, it was involved in an accident while driving on the track. Afterwards, the car was fully restored and repaired by a Porsche dealership in Kuwait and was fitted with wider rear wheels. Purchased by the current owner shortly thereafter, it now presents beautifully throughout. Furthermore, the engine was rebuilt at the same time and is said to perform wonderfully. More recently, the car received an oil change in house at the consignor’s collection earlier this year. Finished in menacing black over a black interior, the car sports leather-trimmed bucket seats and a sport steering wheel, adding to its overall desirability. It would surely make a thrilling example to any Porsche collection and is ready to be driven and enjoyed as its manufacturers intended. 336 1995 Ferrari F512M 101228 €180,000 €230,000 $201,600 $257,600 This European-delivered example is presented in its original colors of Rosso Corsa with a Nero leather interior. Imported into the UK in 2015, this example has a comprehensive service history; minimal mileage has been completed since a cambelt and fluid service was completed towards the end of 2017 by Foskers. Importantly, it is accompanied by its original books and tools. Presented in traditional Ferrari colors, this fine example presents a great opportunity to enjoy the final and best version of the mid-engined flat-12 Ferraris. 337 2005 Mercedes-Benz CLK DTM Coupe WDB2093421F121634 €225,000 €275,000 $252,000 $308,000 Finished in black and white Alcantara interior, this is just 21,800 km from new. Recently, the car has been serviced at a Mercedes-Benz dealer and is ready to be driven and enjoyed as its manufacturer intended. Mercedes-Benz AMGs produced so far into the 21st century and AMGs deserve a place in any collection of German sports cars or AMGs. 338 1982 BMW Alpina B7 Turbo WBAEA3108C5571324 €90,000 €100,000 $100,800 $112,000 A late-production example has been first delivered in 1982, this example’s Alpine white paintwork and interior are a testament to the love and care bestowed on it by previous owners. Passing through owners in France, Luxembourg and Germany, it was acquired by its current owner and exported to Switzerland from 2017 by its current owner. It has retained all of its Alpina accoutrements and presents wonderfully both inside and out. Just 183 B7 Turbo coupes were built to be elegant, understated looks. A gentleman’s supercar, perfect for high-speed touring across Europe, this is a highly compelling alternative for someone’s looking for 6 Series looks and the bit better than BMW’s normal offerings. 339 2015 BMW M5 30 Jahre WBSFV9C59FD594265 €70,000 €80,000 $78,400 $89,600 This example was originally delivered to Canada and features the special ‘Frozen Dark Silver’ paintwork, 20-in. lightweight M 601 wheels housing M carbon ceramic brakes, special embroidered black merino leather interior with Alcantara accents and ’30 years’ badging. Purchased by the current owner in 2017, it was imported to Switzerland in the consignor’s collection, along with a handful of its predecessors. It presents in pristine condition, having covered under 400 km from new. Without a doubt the ultimate incarnation of the F10 BMW M5, the ’30 years’ package adds a number of unique upgrades to an already excellent car. For the individual that missed out on purchasing one new, finding another opportunity to purchase one with such low mileage would be rare indeed. 340 2017 Morgan Aero 8 SA9EAA8ATHE004048 €110,000 €130,000 $123,200 $145,600 This particular Aero 8 is available in Lapis Blue, a Porsche color, with navy mohair hood and side screens. Inside, the tan leather quilted seats are complemented by box weave carpets in Oatmeal and Tawny Ash veneer trims. Add to ‘Aero Racing’ performance pack, which includes page exit exhausts, red callipers, gloss black diffuser and an AR Motorsport detail pack complete the specification, along with an automatic transmission. The car was built to European specifications and delivered to Lowman Exclusive, Morgan’s dealership in Holland. Purchased by the current owner in 2017 and imported to Switzerland, it has remained in the current owner’s collection ever since. Beautifully preserved, with a palette 135 km on its odometer at the time of cataloging. Featuring an intoxicating blend of classic looks with modern underpinnings, this Aero 8 is sure to turn heads among the most exotic company. A fine addition to any collection. 341 1998 Mercedes-Benz SL70 AMG WDB1290761F171128 €125,000 €175,000 $140,000 $196,000 This SL70 was delivered to Japan in June 1998 and has been upgraded to include the AMG option for the R129 SL600, including: carbon fiber interior trim, a color-coded body kit, smaller steering wheel, split-rim alloy wheels , xenon headlights, and a sports exhaust system. Specified in ‘Triple Black’, it oozes menace and potency. Imported from Japan to Switzerland by the consignor in 2016, it presents very well in largely original condition. Quite simply, one of the ultimate AMG-tuned Mercedes-Benzes. 342 1985 Ferrari Testarossa 60227 €125,000 €150,000 $140,000 $168,000 Finished in a seldom-seen Grigio paintwork over a Nero leather interior, this early and desirable ‘monospecchio’ (single-mirror) presents beautifully throughout in original condition. Chassis no. 60227 what delivered by SA MO CAR of Rome to its first owner, Ettore Torchio, who kept it for four years before selling it to Mario Morsilli, the owner of a specialized Ferrari garage, who kept and maintained the car by himself until 2017, when it was acquired by the current and third owner. Thanks to its brilliant styling and amazing performance, the Testarossa has become Ferraris ever built. Boasting just three owners from new, this would be an excellent example for any enthusiast to own and enjoy. 343 1988 BMW M5 WBSDC9307J2791182 €50,000 €70,000 $56,000 $78,400 According to the accompanying CARFAX report, this M5 has been released in Illinois. It passed between owners in South Carolina, Minnesota and Ohio before it was purchased by the current owner in late 2016 and exported to Switzerland in early 2017. The fastest production of the world has ever happened at the moment of its unveiling, the E28 M5 an icon in its own time and still remains hugely desirable today. Having just recently celebrated its 30th anniversary, these earliest M5s still provide exciting performance, even by today’s standards, and are excellent automobiles for the individual looking for a fun, yet practical youngtimer that will only get better with age. 344 2000 BMW 750iL WBAGJ010X0DG50957 €30,000 €40,000 N/R $33,600 $44,800 This 750iL was originally registered in Germany in 1999, where it remained until 2015, when purchased by the consignor. It is extremely generously specified and benefits from a host of ‘BMW Individual’ options, including sepia violet metallic paintwork, extended cream leather piped in navy, Alcantara headlining and rear seats featuring electric adjustment and TV with upgraded DVD player. Accompanied by its original service manuals, showing services in Germany through 2015, it boasts less than 28,000 km from new. Beautifully outfitted and presented today, this is certainly one of the finest E38 7 Series in existence. 345 1991 Bentley Turbo RL SCBZP03A9MCX34957 €25,000 €30,000 N/R $28,000 $33,600 Among the RL customers in 1991 who wanted the lengthened wheelbase was the Prince of Wales. Finished in the classic combination of Balmoral Metallic Green with gold coachline, the Magnolia hide interior is complemented by Parchment Wilton carpets an unmarked walnut veneer. It is thus among the last pre-facelift cars to feature a column gearshift. While its early history is not known, the car has been exported from Japan to Switzerland in late 2016 by its current owner. Bentleys at its best. 346 1993 Daimler Double Six SAJDDJLW4CR487089 €15,000 €20,000 N/R $16,800 $22,400 This article was among them leaving Brown’s Lane in Cranberry Red Mica with classic Doeskin leather from Japan. 347 1996 Mercedes-Benz S600 AMG WDB1400761A296397 €20,000 €30,000 N/R $22,400 $33,600 This W140 S 600 coupe, finished in Malachite Green Metallic Dual Tone Gray and Black Leather, features the newest and most beautifully made in Japan. Features include double-glazed windows and parking sensors. Engine power was upgraded to 439 bhp with revised camshafts, pistons, connecting rods and a remapped ECU. The same engine would later become the Pagani Zonda. Famously, AMG does not reveal production numbers. Mercedes made 1,372 standard S600s for export, and marque experts put the number of AMG cars at a ‘handful’. This very well-kept example will certainly provide countless thrills to those lucky enough to get behind the wheel. 348 1994 Mercedes-Benz S600 WDB1400571A213580 €25,000 €30,000 N/R $28,000 $33,600 Delivered new to Japan and finished in Blue-Black Metallic paint over Black leather trim, the car remains in Japan until 2017 when it was purchased by the consignor and imported to Switzerland. The optional footrests, air-conditioning, seat-heaters and adjustable seats make the rear cabin a quiet place for refined motoring. Only the discerning would notice the car with its AMG black-out chrome, tinted windows and electric rear window. For the individual looking typical Mercedes-Benz luxury yet something with a bit more, this S 600 certainly fits the bill. 349 1992 Bentley Turbo RL SCBZP03D5NCX44168 €30,000 €35,000 N/R $33,600 $39,200 This Bentley Turbo RL was produced in 1992 and spent a significant part of its life in Japan. Exported from Japan in 2016, this Turbo RL was acquired in Germany recently by the consignor and was subsequently exported to Switzerland. Tastefully outfitted in black paint over a grey leather interior, this Turbo RL is an excellent route into Bentley ownership. 350 1989 Mercedes-Benz 560SEL WDB1260391A481277 €40,000 €50,000 $44,800 $56,000 First registered in Japan in 1989 and delivered in dark blue with a red velor interior, a range of options were specified, including rear footrests, automatic climate control, heat insulating glass and heated front and rear seats. This 560 SEL spent most of its life in Japan following its export in November 2015 to Germany and Switzerland the following year. Presented in a tasteful color scheme Mercedes Benz had to offer a few weeks ago. 351 1982 Nissan 280ZX JN1HZ04S9CX454086 €20,000 €25,000 N/R $22,400 $28,000 With just over 3,500 miles on its odometer, this 1982 Nissan 280ZX has travelled less than 100 miles, on average, for each year of its life – a remarkable exercise in restraint given that it was one of the most exciting and desirable sports cars of its time. Delivered new to Winter Haven, Florida, and presented today in a very 1980s colour scheme of Dark Brown with Gold accents, this 280ZX was specified with the optional leather and suede package, power windows and cruise control as per its original window sticker. In addition, original documentation also includes the original purchase invoice and the original warranty card. It was purchased out of its home state of Florida in 2016 by the consignor and subsequently imported to Switzerland. With interest in Japanese classics rising, this 280ZX presents an ideal proposition for a collection of only the most original examples of these cult classics. 352 1979 Rolls-Royce Silver Wraith II LRX36864 €20,000 €25,000 N/R $22,400 $28,000 Prior to being registered in Switzerland with its current owner, this Silver Wraith II was previously registered in Germany and Monaco. This example presents well with black paintwork and a cream leather interior and carpets. Only 2,125 Silver Wraiths were produced in period, and they are now increasingly prized by collectors. 354 1960 Porsche Diesel Junior 108K K 9748 G €19,000 €25,000 N/R $21,280 $28,000 While many Porsche tractors were used as their manufacturers intended and lost to time and the arduous nature of farming, this example is certainly the exception to the rule. Delivered new to the Mattioda Family and their farm in Castellamonte, near Turin, Italy, this Diesel Junior 108 K remained at their farm and in their ownership until only January of this year. Having acquired a new tractor to replace their Porsche in the 1980s, rather than trade it in, the family opted to keep the tractor and parked it in a corner of their barn where it remained untouched for decades. Hugely original throughout, it still bears the original sticker and paintwork, and is reported to still be in running and driving condition, having never been fully restored. Opportunities to acquire a Porsche-Diesel like this certainly do not come every day. For the Porsche enthusiast looking for a stablemate to their 356, it would be difficult to do better than this. All information is copyright Auto Auctions Monthly except images which are copyright of Artcurial, Bonhams, Gooding & co., Mecum, RM/ Sothebys, Russo & Steele and Worldwide Auctioneers. All figures are US$ and gross unless specifically stated. All figures are accurate in the home currency for the sale, any figures in other currencies are calculated based on the exchange rate for the date of sale accessed from FxTop.com. Percentages as given are calculated as the % below low estimate or above estimate as noted. All information given for recreational use only and cannot be personally guaranteed for accuracy by the author.